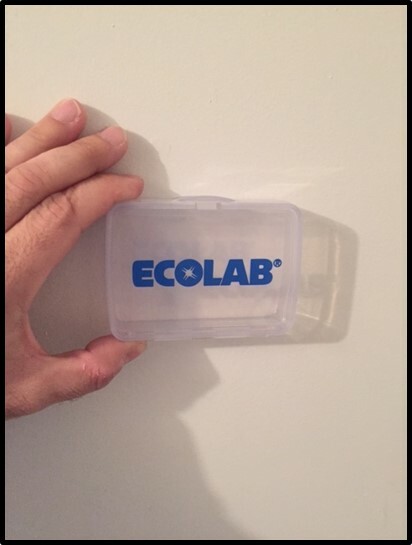 Ecolab is a chemical company that provides various forms of cleaning chemicals and sanitizers to businesses like restaurants, retailers, hotels and grocery stores. The rollout of a Tim Hortons project requires extensive project management, mapping/routing/ scheduling, training and quality assurance. CCIS has been working behind the scenes on this project since October of last year, and the scope of the project is constantly changing. We have been working to prepare a rollout package for each Technician, that includes all the information you need plus a well laid out route. The goal is to be as efficient as possible (2 sites a day) but uphold the highest standard possible as it affects the food saftey across 3,200 locations, quicker is not always better. As a field technician you will be a critical component to a successful installation rollout. Please study this course carefully and be sure to carry a physical copy of the provided guide with you in the field. A PDF version can also be downloaded by clicking on the red download link located on the top-left of this page. This installation will also have a warewash component. 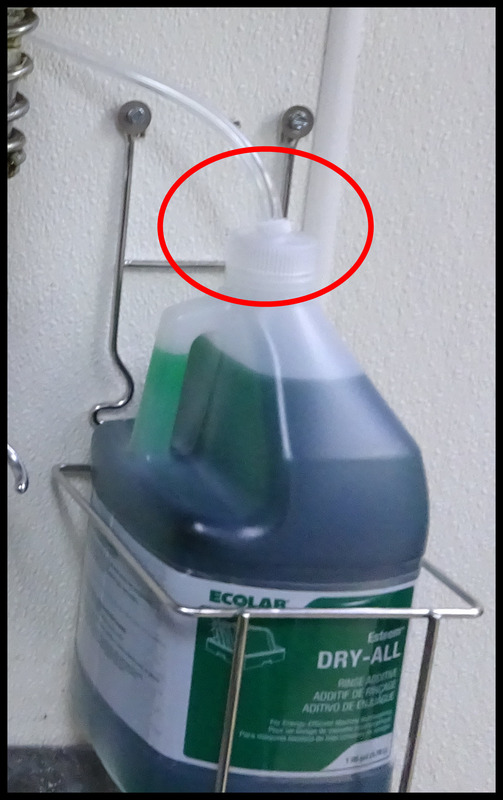 You will be required to hook up warewash equipment with Ecolab's cleaning products. 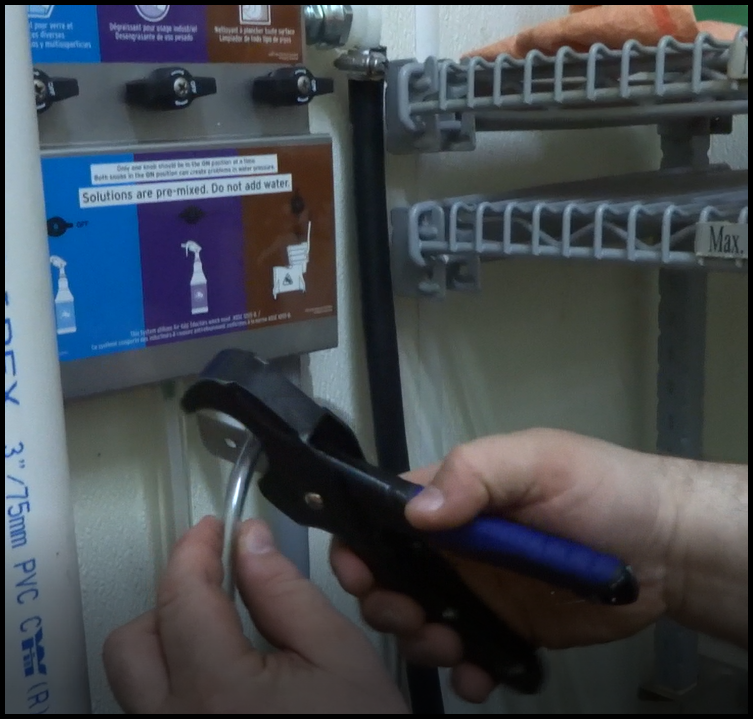 You will be required to train store managers and team members at the end of each installation on proper product/equipment usage. The Quality Assurance Team within Tim Hortons is very particular about their standards, and our customer Ecolab has worked for years to obtain this contract. It is our job to ensure we not only meet all their expectations, but exceed them in areas of skill, expertise, and customer service. The predetermined schedule is to be followed at all costs, the only exceptions will be made if a site needs to be bumped up or back by 1 day, after the site has been given a minimum of 72 hours notice. All sites will be called in advance by CCIS, but each Technician will be expected to call each site the day prior to the install to confirm their expected arrival. If a Tech arrives on site and is unable to complete the install, CCIS must confirm that all efforts were made to contact the site in advance to prevent missed opportunities. Also a Tech MUST CALL CCIS from the site if they encounter any challenges. Installs are to be conducted after 2pm, to avoid high traffic times within the restaurants. If a site provides advanced permission to come earlier, then the Tech is able to install before 2pm. Weekend installs are permitted following the time parameters above. Techs are expected to be professional, prompt, clean and provide a very high level of service. All equipment and product from previous supplier should be neatly boxed up and left with the restaurant manager. 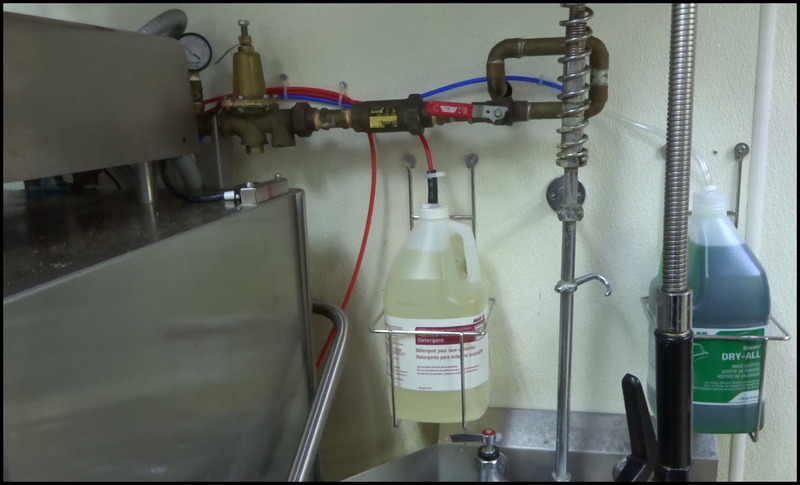 Instruct the Restaurant Manager to review their municipality’s chemical disposal process when removing the Diversey products from their restaurant. Installers should also ensure boxes, labels, bags, etc. 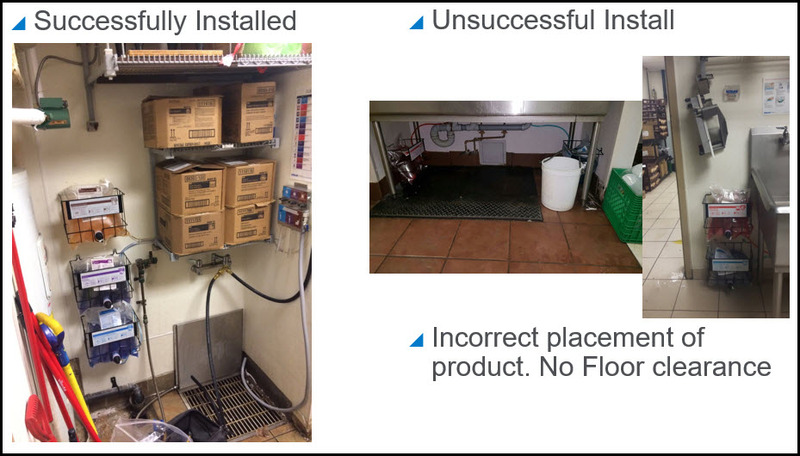 from QSR install kits are cleared from floor and shelving areas and disposed of properly. 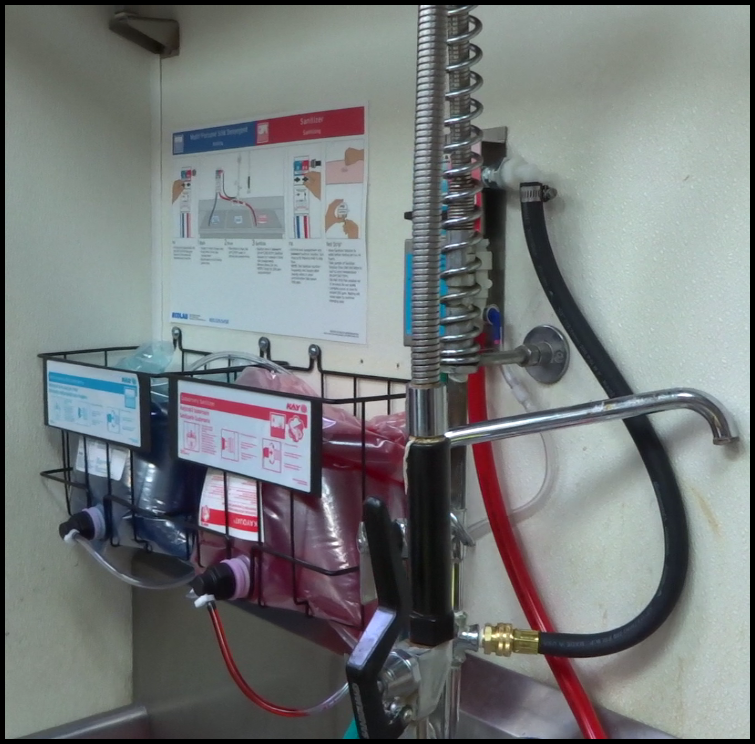 Ensure staff are trained on both how to test sanitizer as well as how to replace empty product bags before you leave the site. 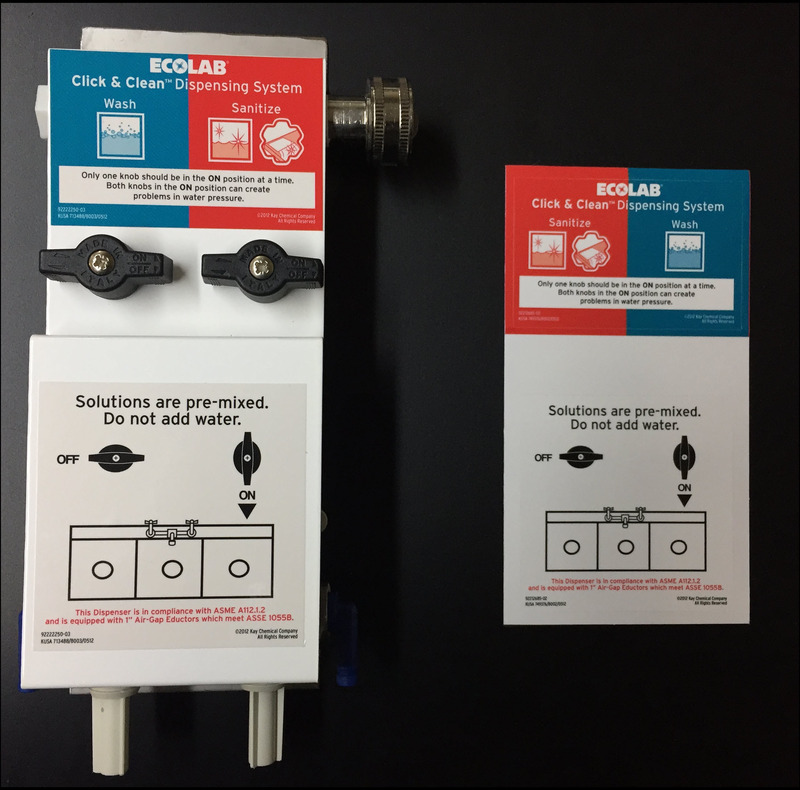 Ecolab personnel will be providing in-depth training after our install, but it is important staff knows how to do these 2 things immediately. 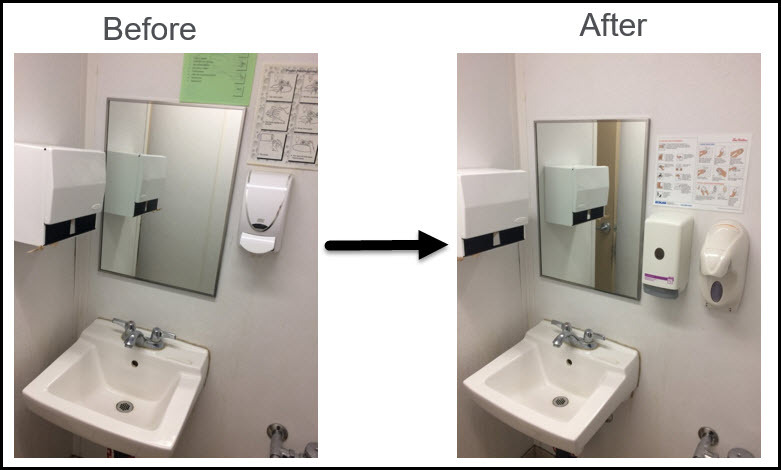 Last year, while dismantling a soap/sanitizer dilution unit at a 3 compartment sink, one of our technicians had sanitizer sprayed and he received an eye injury. The safety and well-being of our technicians is and always will be of great concern to our CCIS, incidents such as this reminds all of us that safety has to be first when starting any job. 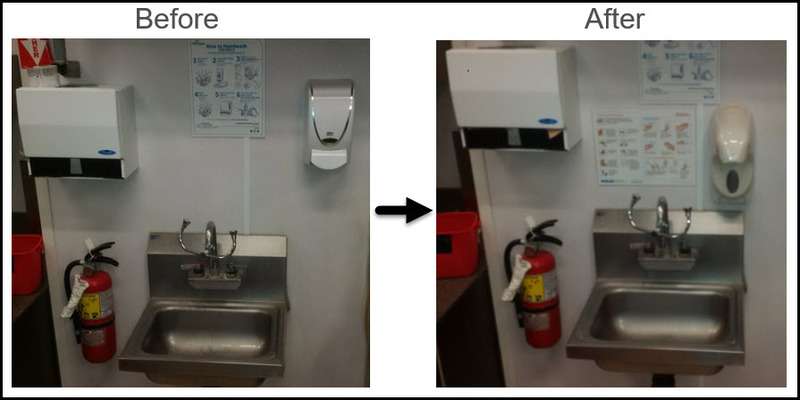 It does not matter whether it is simply removing a soap dispenser or installing dilution units there are hazards in what we do each and every day. The nature of our work is about getting the job done properly and in a timely manner. We would like to also add and remind all technicians that SAFETY has to come before quality and quantity of work. 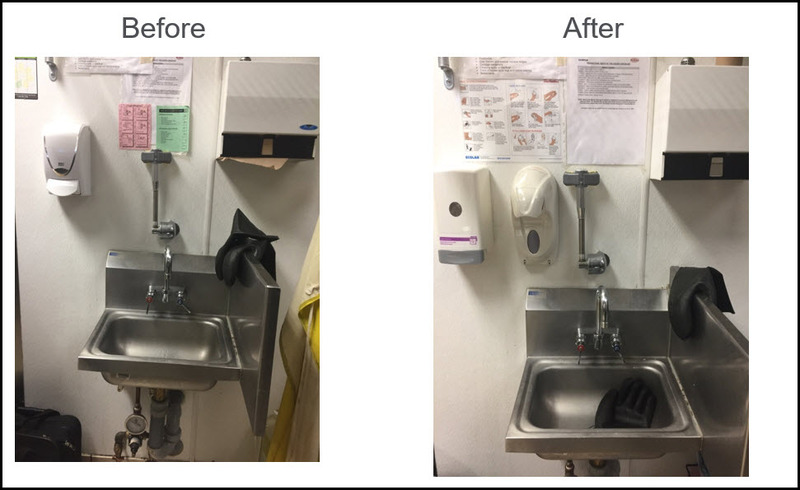 CCIS technicians are required to wear protective gloves and eye-wear while conducting installations with a chemical dilution component including hand care dispensers. Wear a CCIS collared golf shirt, clean pants (NO SHORTS), a CCIS lanyard and name badge. If you required more supplies please notify our office. Ensure you have a smart phone or tablet (WITH A DATA PLAN) as each site will require an electronic sign off and 6+ photos. If you have challenges with your device or dataplan please contact CCIS. In the food preparation area you will be required to wear hair nets, and beard nets if applicable. Upon entering the store, ask to speak with the manager. Present the manager with your CCIS ID Badge/ site access letter (CCIS to provide a letter of intro). 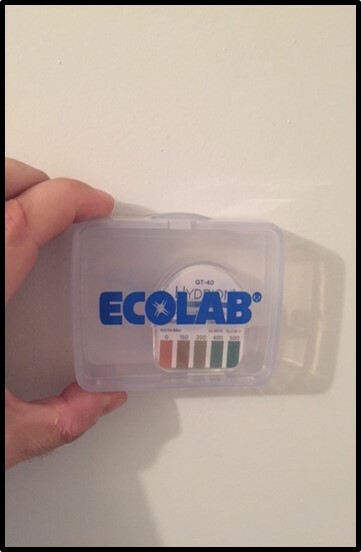 Introduce yourself as a CCIS technician doing an installation of behalf of Ecolab. 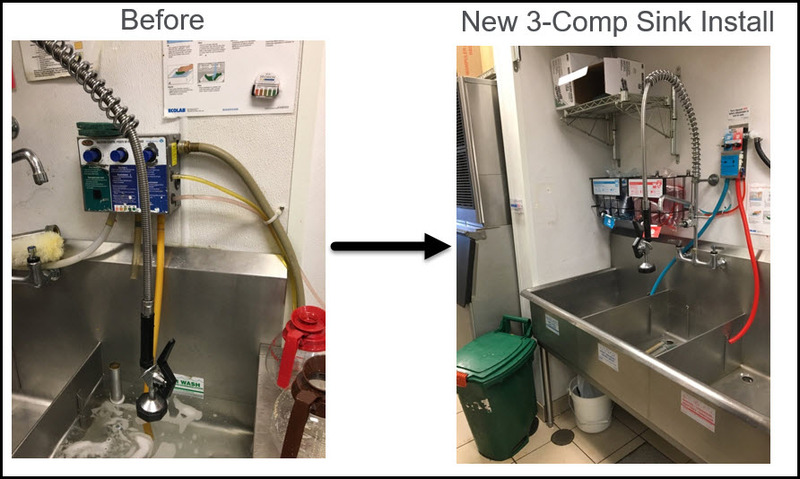 Explain that you are there to install our automatic dispensing system and that an Ecolab Rep will follow up within 72 hours for the formal Training Program. Discuss with the manager the intended location for the equipment systems prior to the actual installation. Obtain approval on each dispenser position prior to commencing, get feedback on using the existing location or requirements for shifting to a new position. Take into consideration any wall charts that will need to be installed. Immediately begin to sort and pre-assemble the equipment. Please stay out of the way of the team members as much as possible allowing them to complete their prep work. 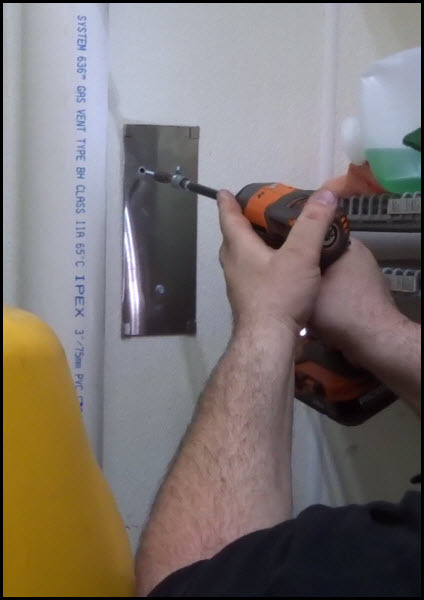 Clean up any dust that may result from drilling for installations (the wall and floor around the dispenser and inside the dispenser). Must clean up any spills/debris/dust that results from transportation of equipment or construction. Clean up any debris left from old equipment. Maintain a clean and organized working area where product is staged/stored. No food, drink, or gum chewing is allowed in your work area. Follow the sites policies on garbage disposal, no chemicals to ever be disposed on down a sink. Take all remaining equipment with you upon completion, this can be used for car stock at the following sites. A SDS binder will be included in the install kit. 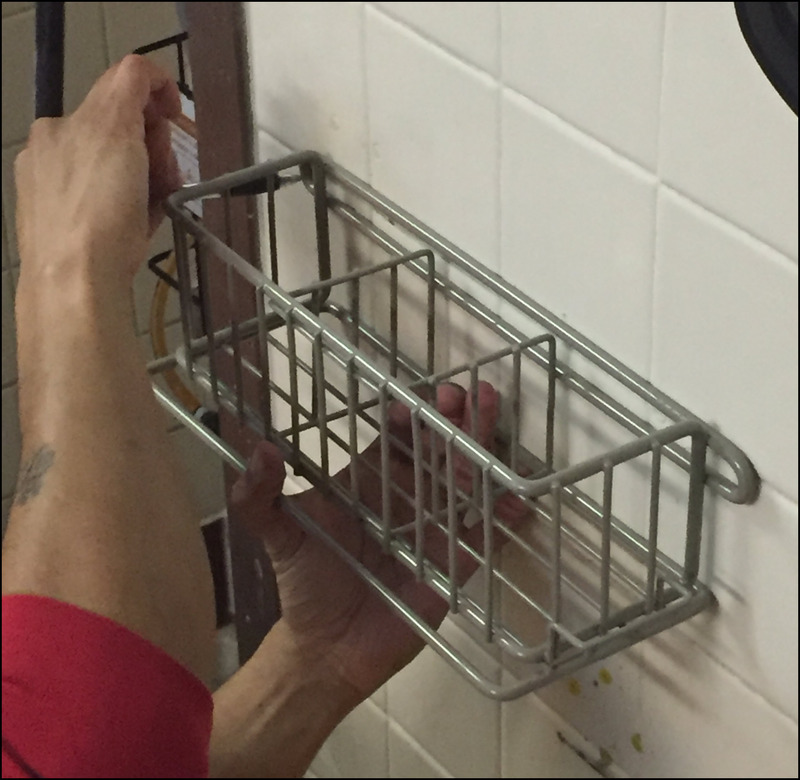 Be sure to mount the rack that holds the SDS binder in a place approved by the manager. Please review the SDS binder with the manager and the team member during training. IMPORTANT: Do not discard or remove existing SDS!! Which of the follows actions should NOT be completed? True or False: Old SDS sheets can be safely disposed of. Are we allowed to put old equipment in the garbage? 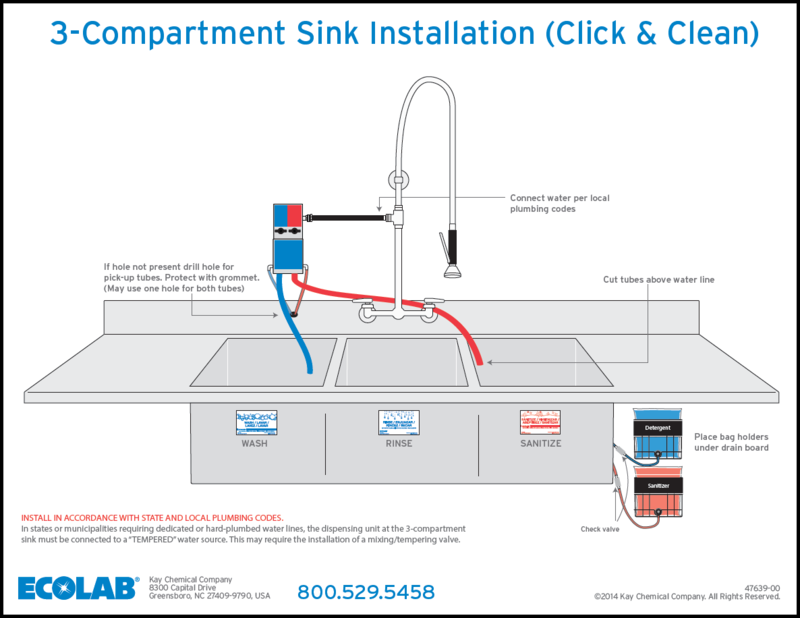 During this component of the installation, you will learn how to install the 2 Valve Click & Click Dispenser at the Compartment sink. The next several slides will take you through the complete installation of the unit. 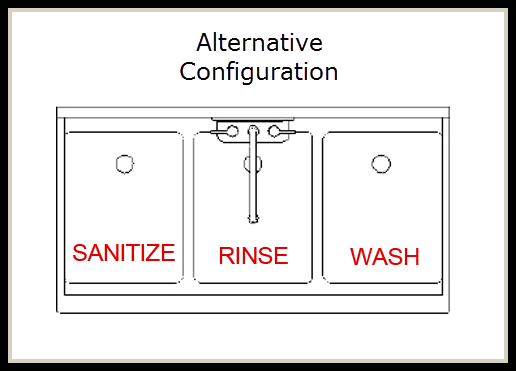 A Food Prep Sink is all called a 2 or 3 Compartment Sink. Restaurants will use this sink to hand wash all the dishes and utensils. 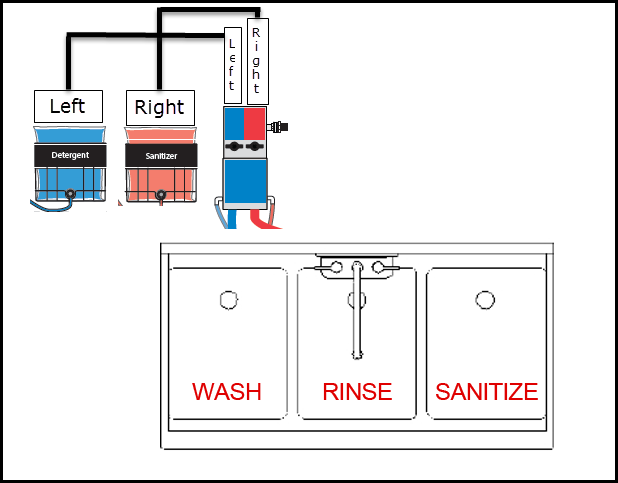 The first sink will be for washing, second for rinsing and third for sanitizing. 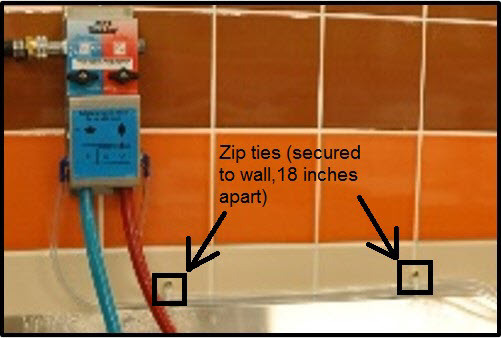 You will mount a pump above the sinks and connect the plumbing to cleaning/ sanitizing chemicals that will auto dispense into the sinks. 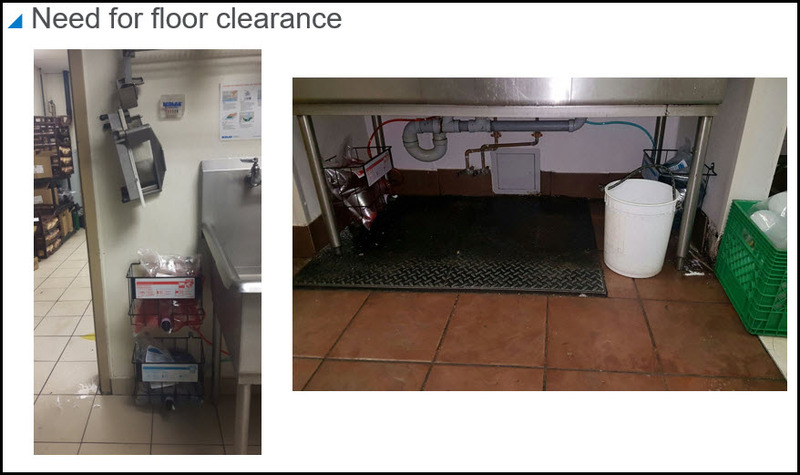 The purpose is to ensure the proper amount of chemicals are used- too much is a waste of money and hazardous to employees sink- too little chemical presents a risk of bacteria. Prior to starting the installation clarify the 'flow' of the washing process at each site. It will either flow from right to left or left to right. If it is left to right, you will need to swap the stickers on the dispenser to accommodate. 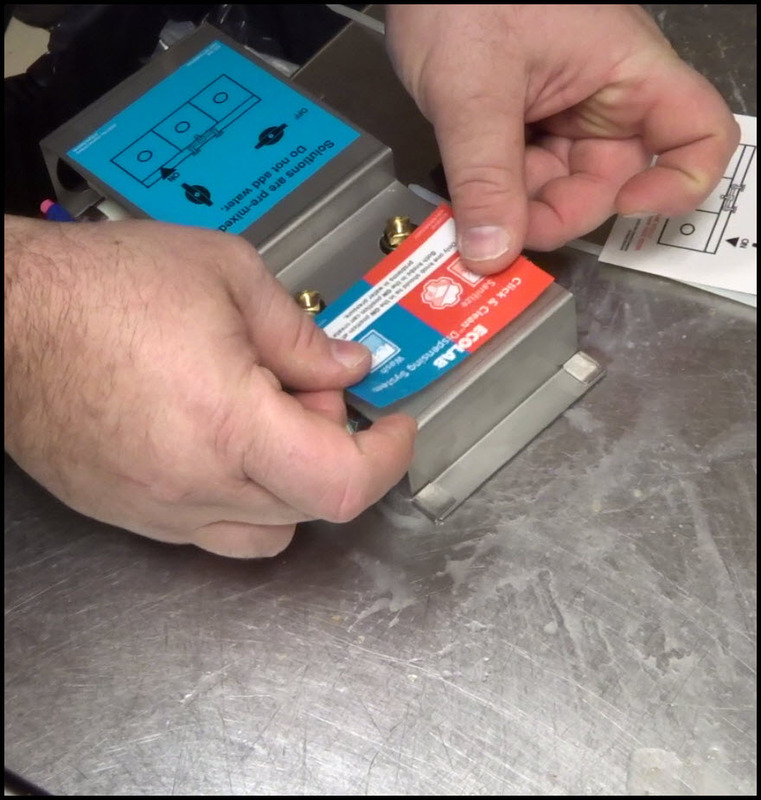 Before we can start mounting the new dispenser, we must first remove the old one currently installed. Remove old wall anchors and caulk holes that will not be covered by the new equipment. Do NOT caulk over existing anchors; be sure to remove them first. This also includes removing all the old product racks. Be sure to place all discarded discharge/product lines deep within trash containers to ensure employees are not exposed to any caustic products that may be within them. Let the lines drain of product before placing them there. Gather up the old dispenser and racks and place them in an empty card board box (empty one of your installation kit boxes for this purpose). All old equipment is to be saved; do NOT dispose of it. Place all old chemical product together neatly together for the site to either dispose of or transport to another facility to be used. Once the old equipment has been completely removed, thoroughly clean the section of wall it was covering. Before we can actually mount the dispenser, we must first prepare it. 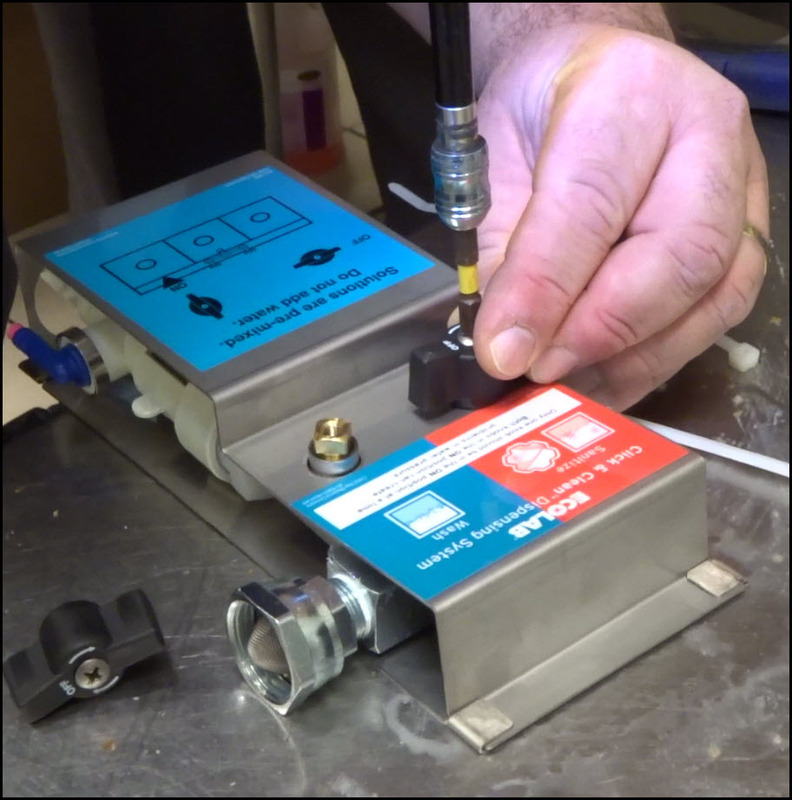 This allows for easier access to all parts of the dispenser, resulting in a quicker and easier install. Preparing the dispenser before mounting it is highly recommended. 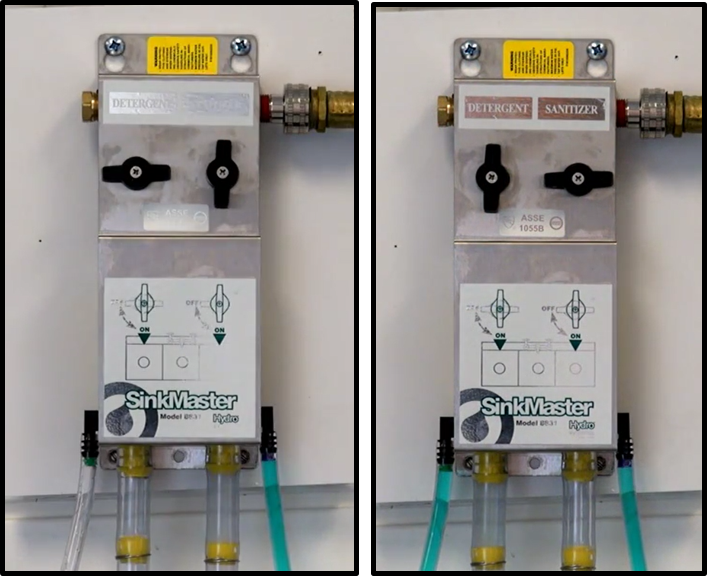 Company's use 'Metering Tips' (tiny plastic rings with hole in center for product to flow through) in their dispensers with varying size openings based on the chemical viscosities. The dilution ratios of each chemical is based on consistency of each chemical and can be affected by water pressure (fluctuating water pressures alter dilution ratios.) The metering tips used in this setting will be Purple and Light Purple. 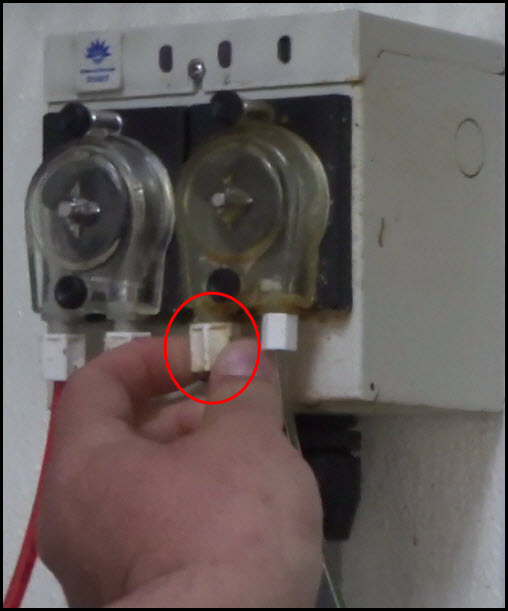 Ensure the correct metering tip is in use for each eductor. 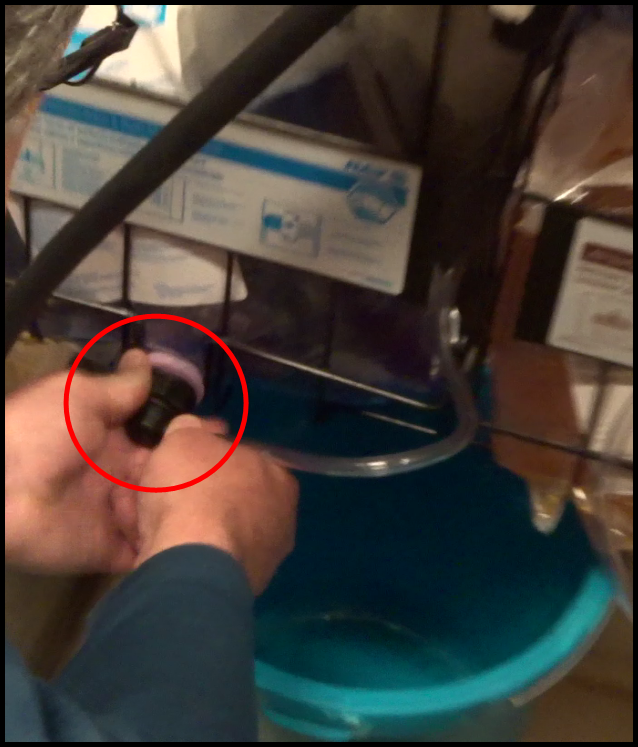 Attach a short piece of product tubing from the blue barb to a check valve. 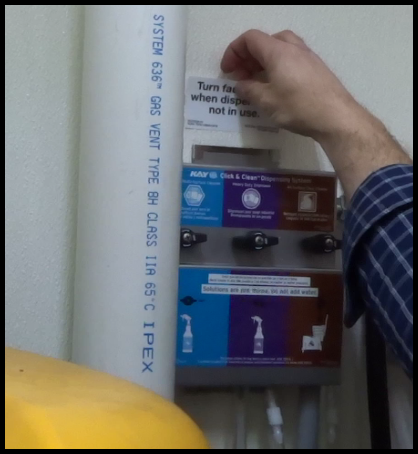 Ensure the arrow on the check valve is pointed towards the dispenser. Run hot water over the first 3 inches of the tube before pushing it on the eductor to make this easier. 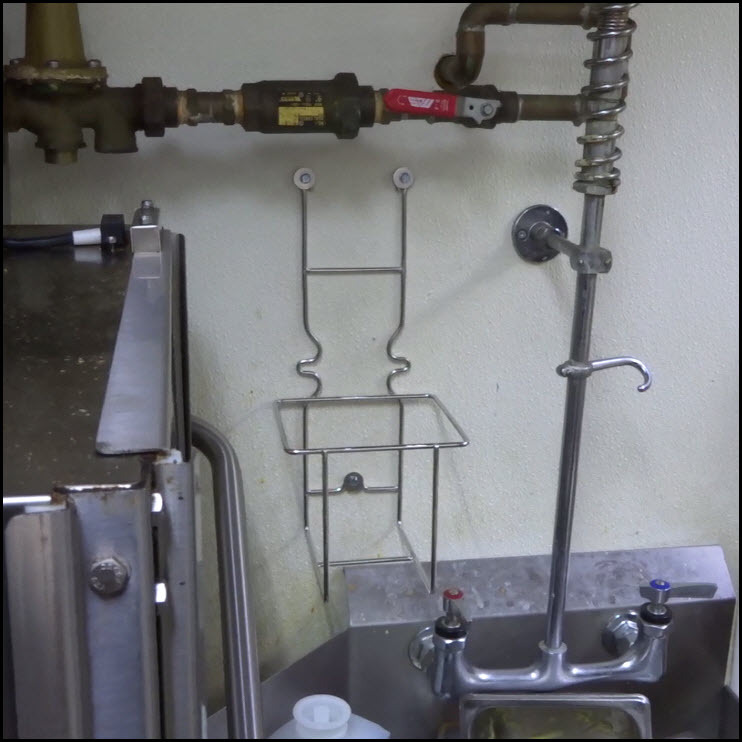 Start by mounting the dispenser back plate over the wash basin of the sink. 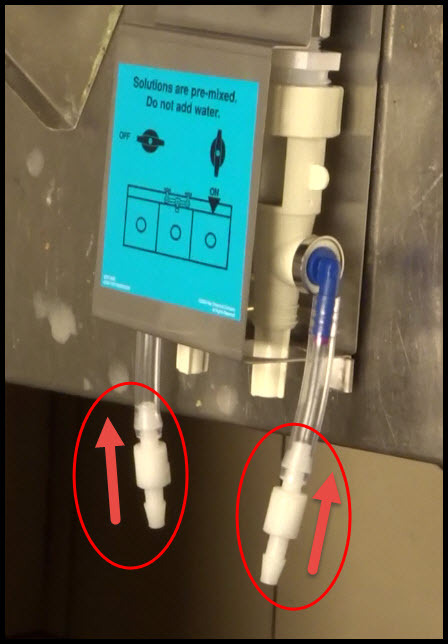 The dispenser should NEVER be mounted over the sanitize basin; this can lead to the dangerous changes in the PPM of the solution. Hold the unit up to the wall and mark top 3 holes for drilling. 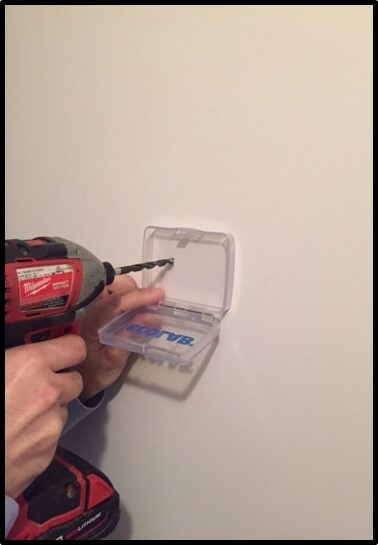 Drill holes for wall anchors with 9/32” or ¼" drill bit. Use dampened paper towel to catch dust. Install wall anchors. If going screwing directly into wood, an anchor is not required. 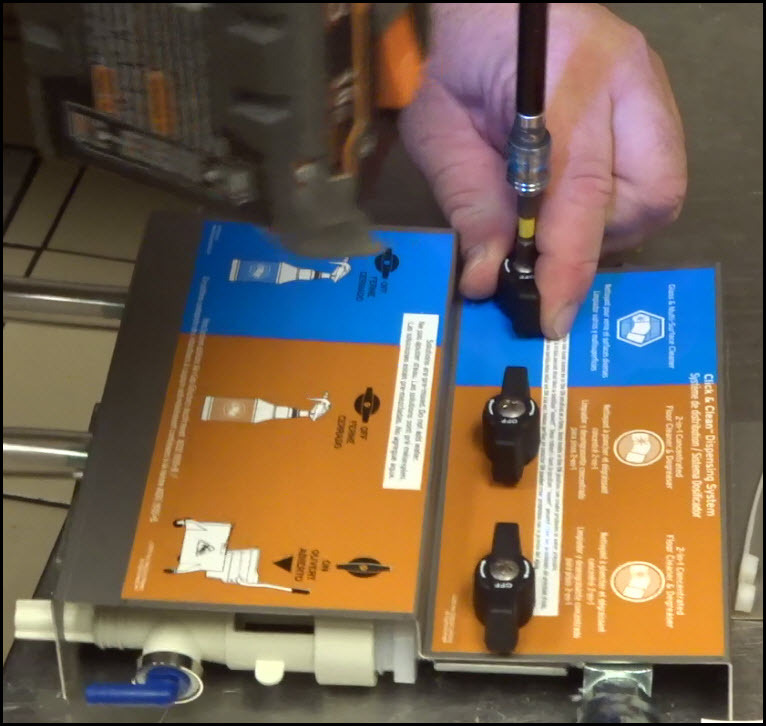 Insert the fully prepped dispenser onto the back plate. Slide the top in first, then the bottom. 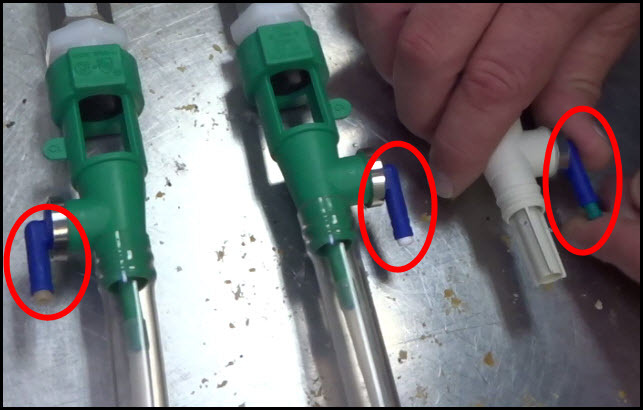 Run discharge tubes in their respective basins (Blue Soap to Wash, Red Sanitizer to Sanitize). 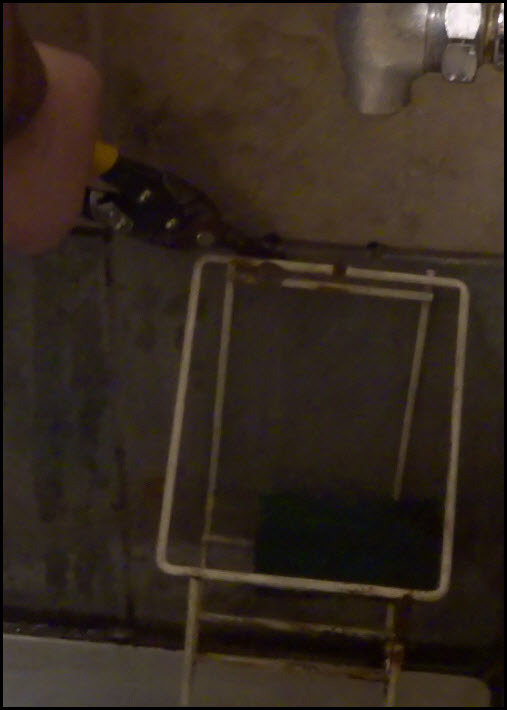 Cut the tubes about 4 inches short from the bottom of the basin. 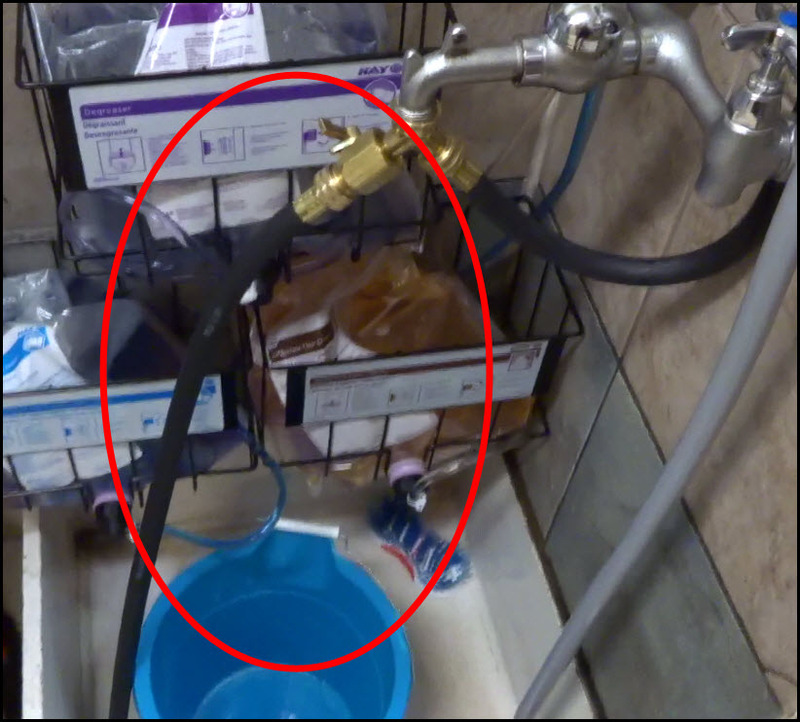 This will prevent the tubes from back-flowing into the dispenser by restricting their ability to be blocked off. Use zipties if required to secure the tubes neatly in place. 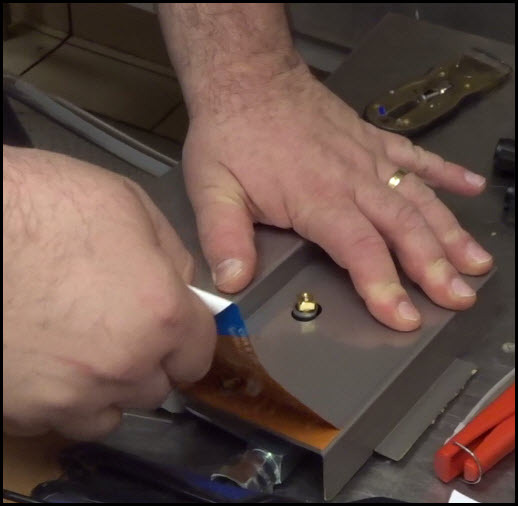 Start by wrapping the threads on the brass connection that will be inserted into the faucet opening with Teflon tape. 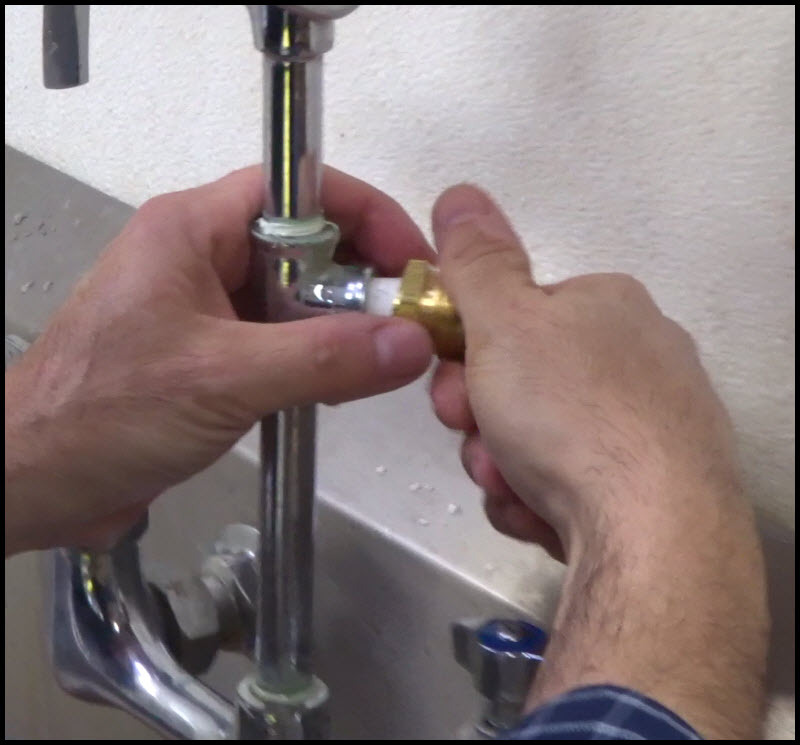 Attach the prepped brass connection into the faucet. Use channel locks to ensure a tight fit. Failing to do so can result in leaks. Connect the water supply hose from the T-junction on the faucet to the white elbow on the side of the dispenser. Be sure to tighten the collar so it does not leak! Connect the other (female) end of the hose to the water supply. Use channel locks to ensure tight seal. Start by applying stickers to the product racks. Put a Pot & Pan Detergent (Blue) and a Kay Sanitizer (Red) on each. 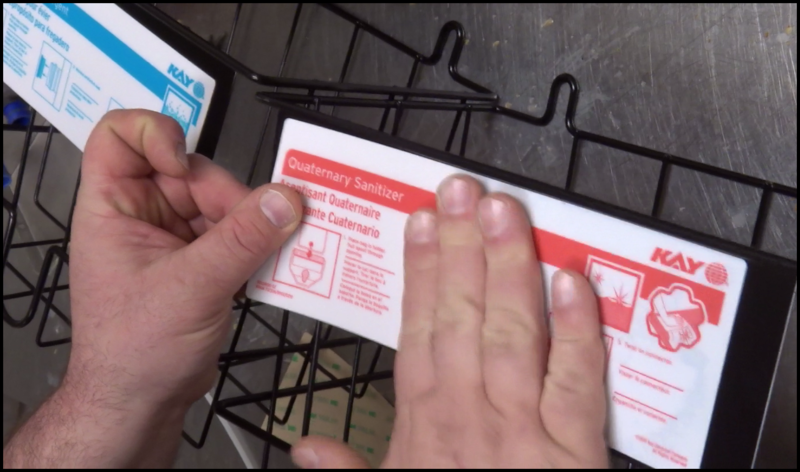 Keep in mind that when mounting the racks, the product orientation needs to match the sticker on the dispenser. 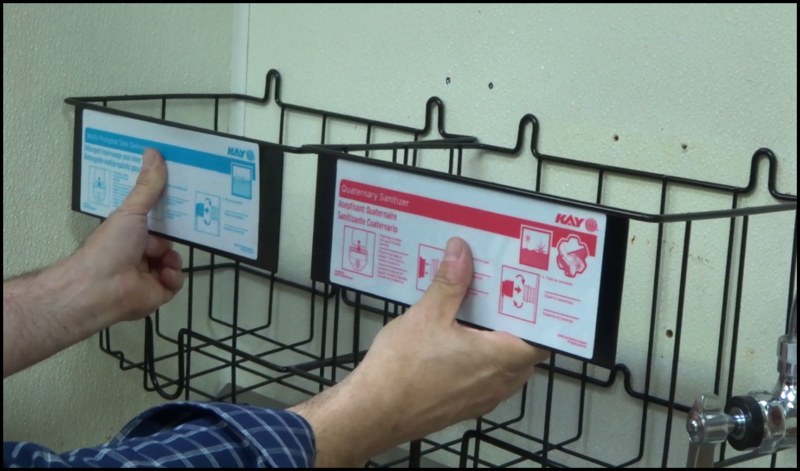 For example, if the sticker on the dispenser has Dawn Detergent (Blue) on the left and Kay Sanitizer(Red) on the right, the racks will need to be oriented so that the Dawn rack is to the left of the Quat rack. Place racks in convenient location, ensuring they are level. 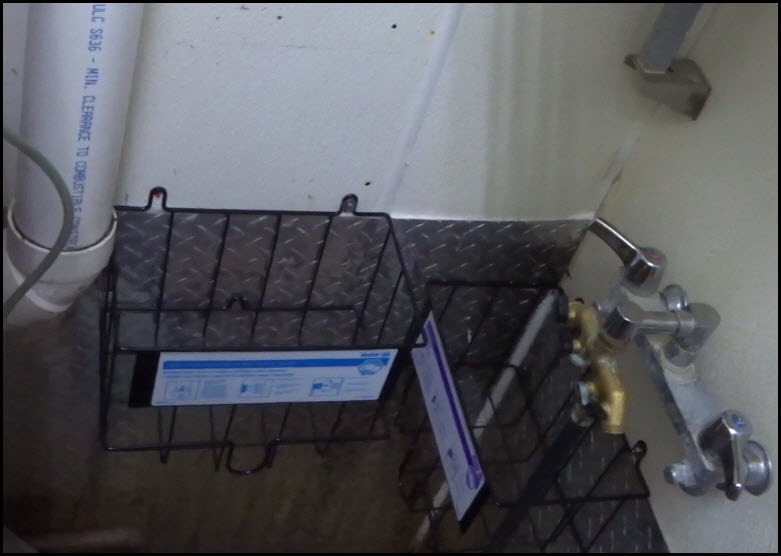 Side by side above the wash sink will be a common placement. If room does not allow, install under counter. Level rack on the wall off the floor 6 inches if installing racking under counter. Mark 3 positions for drilling. Hang rack on the screws & tighten screws. 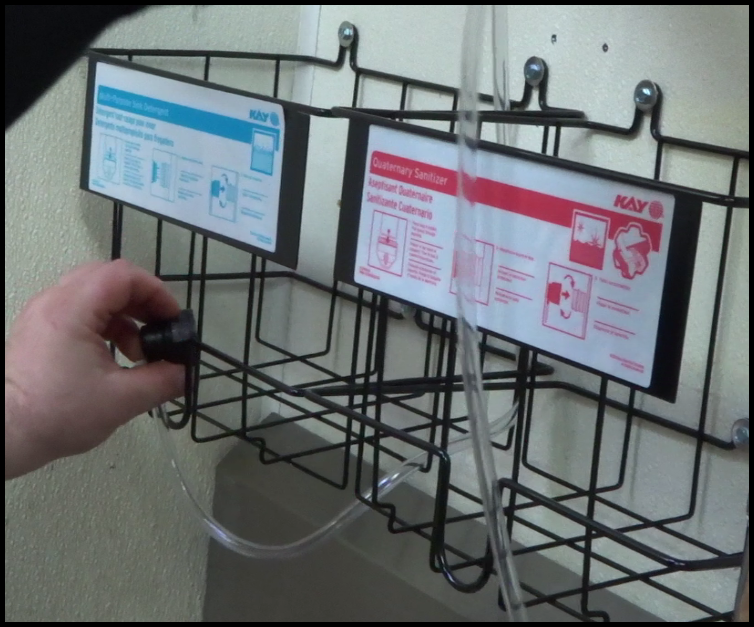 Start by placing each product line within each rack, running up to the dispenser itself. Run the lines as neatly as possibly keeping them towards rear of the racks where possible. Cut each product line to attach to the dispenser. 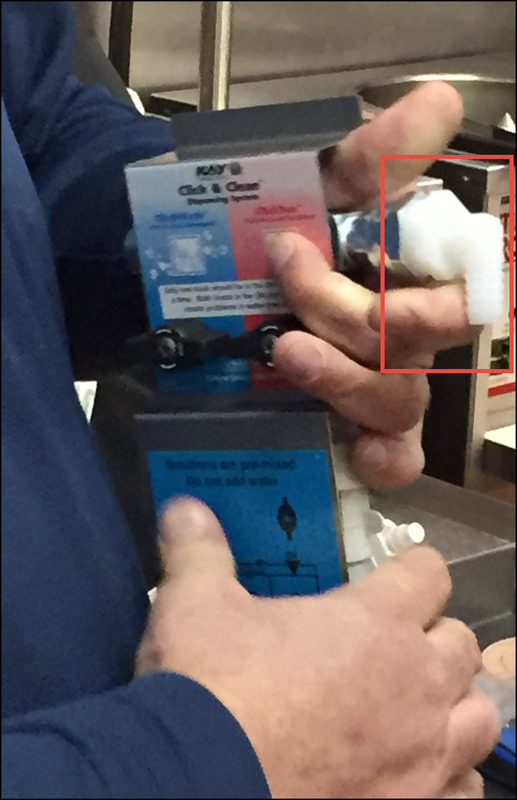 Be sure to cut from the side that will connect to the check valve leading to the dispenser. Leave an adequate amount of slack for minor readjustments. Connect the black mating cap on the end of each product line to each product. Ensure the connection is tight. Clean up any loose product lines. Zip tie where necessary. Open one ball valve to start flow of water and concentrate solution. Run it until the tube is primed. Repeat priming on the other side. Do not remove Veggie Wash stickers inside the sink. Apply new compartment sink stickers to replace the old stickers you just removed. 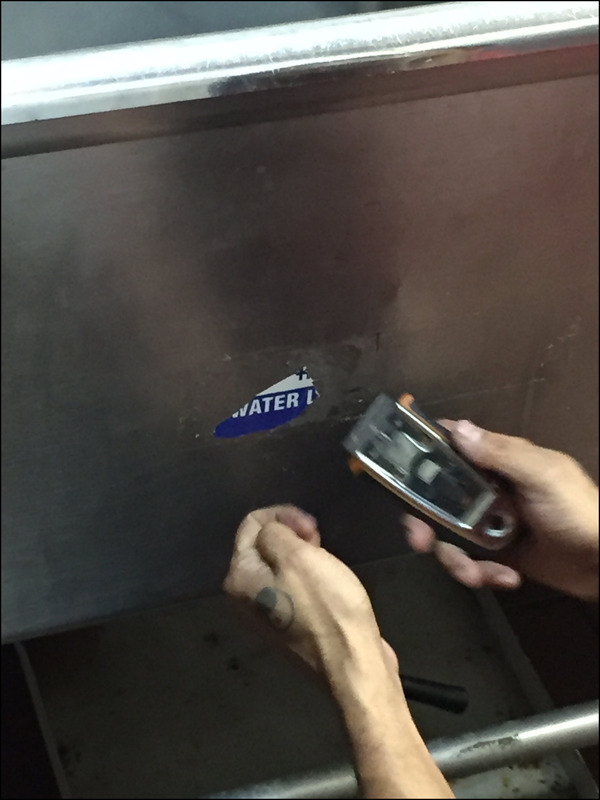 Stickers should be applied to the exterior of the sink, even if existing stickers were inside the sink. 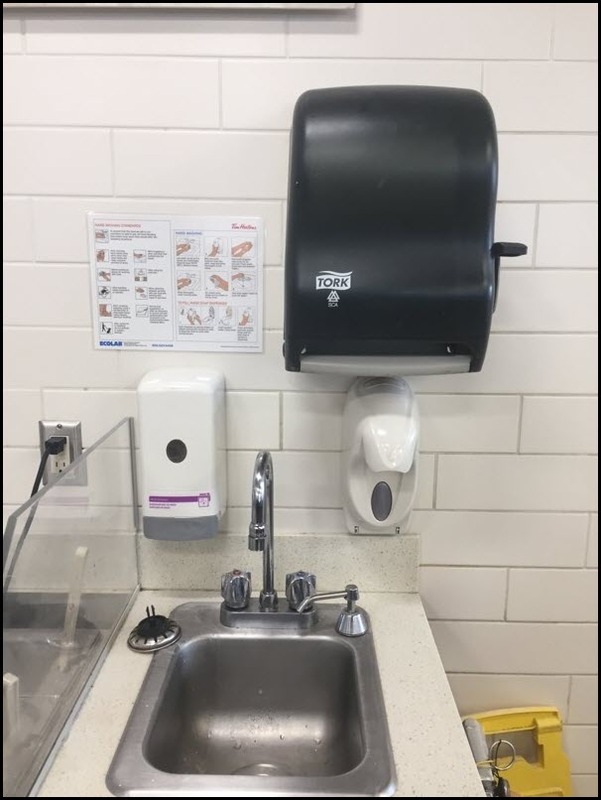 Place the 3-compartment/2-compartment sink wall chart next to the dispenser (Use caulk on back of all wall charts, adhesive tape provided will not adhere properly causing the wall chart to fall off the wall). Ensure placement of wall chart is in an area that minimizes the opportunity for water damage. 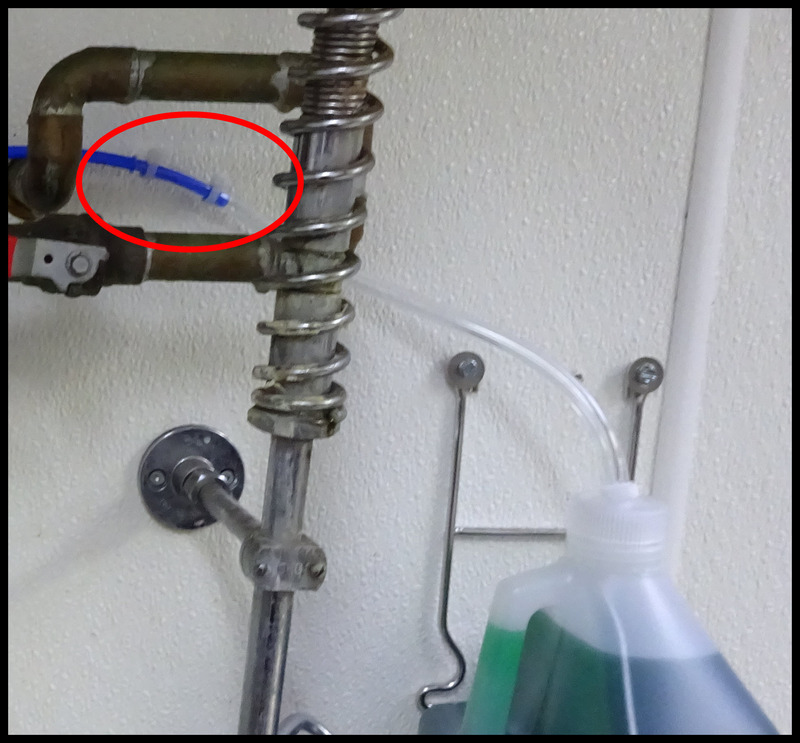 Select location of test Strip Holder away from sink – to prevent test strips from falling into water. 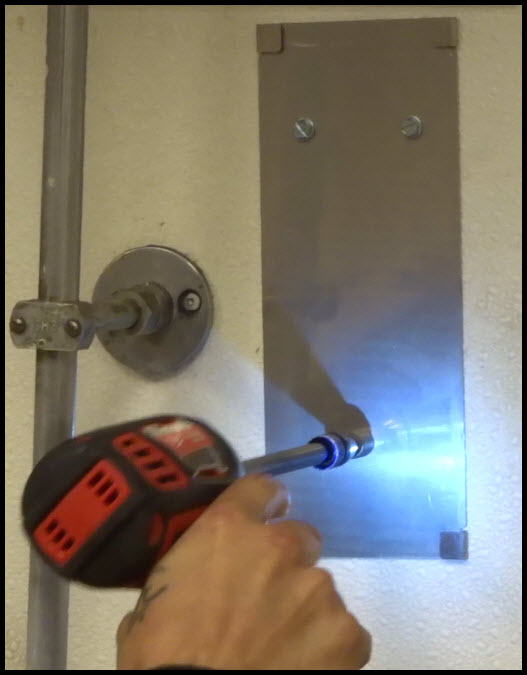 Drill 2 holes with ¼ " drill bit and install anchors in wall. Also Drill holes in Test Strip Holder. Screw Test Strip Holder to the Wall. Use 2 screws.. Insert Test Strips. 1. Withdraw and tear off 1 strip of quat test paper. 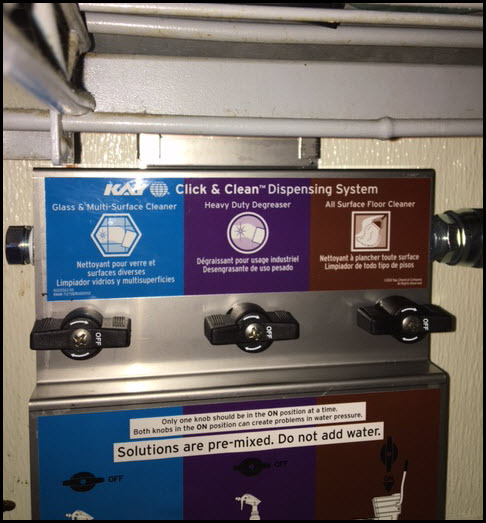 If the Sink Orientation is Reverse: Meaning that the Wash sink is on the far right followed by Rinse in the middle and Sanitize on the far left – We have to place a reverse label sticker on the dispenser like the one on the left of the picture below. The metering tips need to switch sides as well. It is best to unscrew the entire elbow and move it rather than attempt to pull out the metering tip. 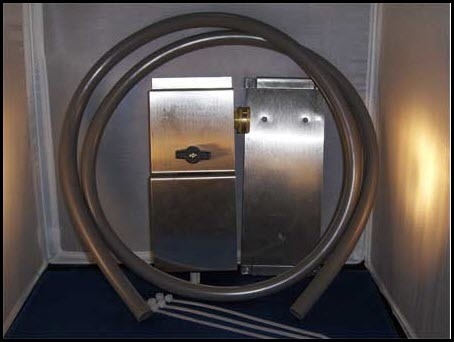 Discharge Hoses and Product Tubing need to be installed with this in mind. Start by unscrewing both knobs from the face of the dispenser. Be sure to hold the knobs in the off (horizontal) position while doing this. Once the knobs are off, peel off the sticker that was covered by the knobs from the dispenser. Apply the alternative product orientation sticker to the face of the dispenser. Reattach the 2 removed knobs to the dispenser. Above: Remember to Caulk holes in walls after removing old equipment! 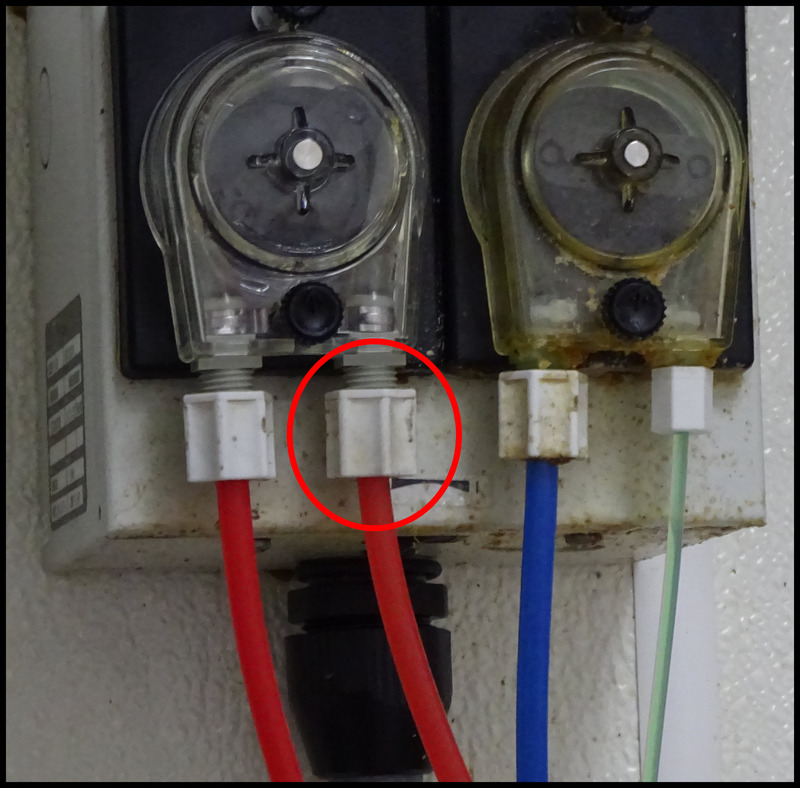 Above: Remember to remove old wall anchors after removing old equipment! 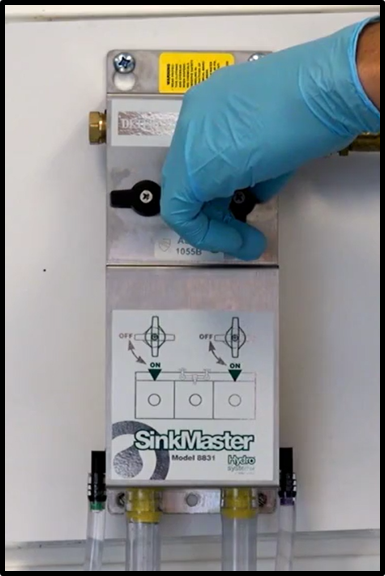 Which sink basin should the Click & Clean dispenser be installed over? 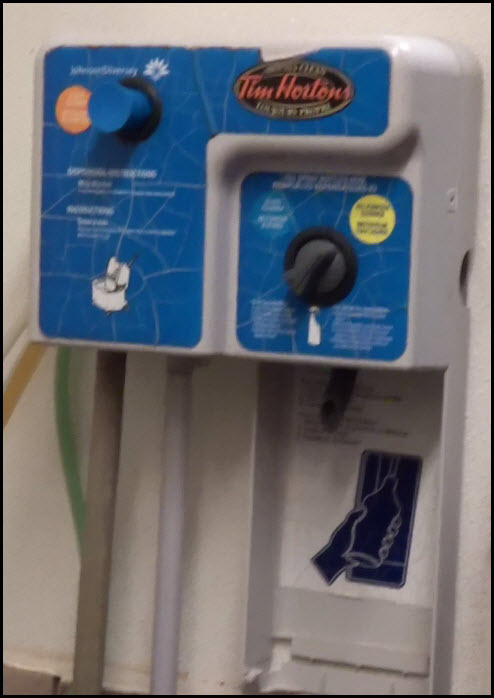 When is the best time to install metering tips and check valves on the dispenser? 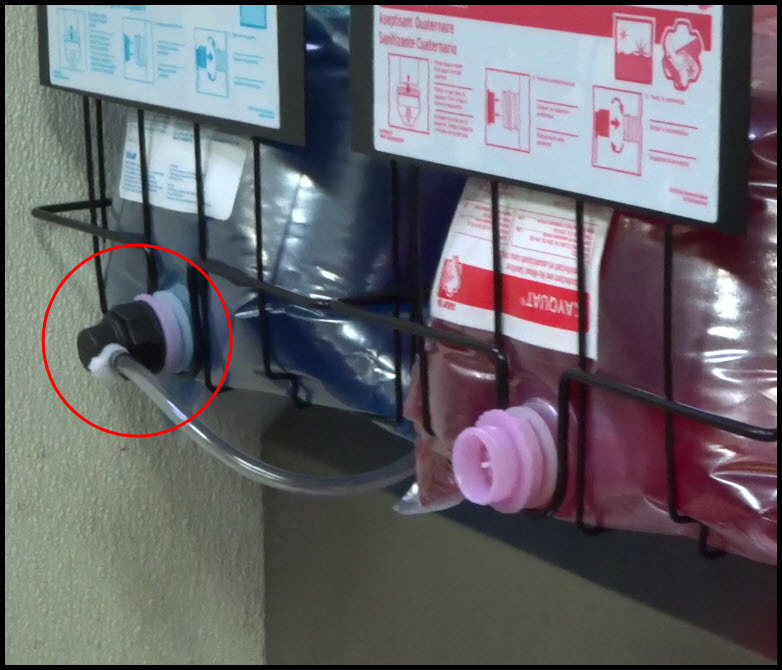 During the preparation period when the dispenser's manifold is easily accessible. Once the dispenser has been mounted. On each check valve there is an arrow depicting the direction of chemical flow. In which direction should the arrow be pointing? Away from the dispenser . It depends on the product. While taking down old equipment should you be wearing gloves and eye protection? Is it mandatory to use Teflon tape at the 3 compartment sink install for the water source T fitting? Where should the test strip holder be mounted? 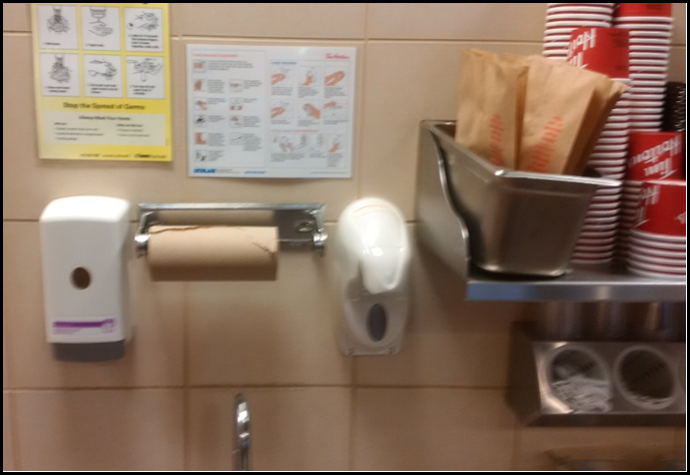 There are several steps we must do before the dispenser can be mounted. Start by unscrewing all three knobs from the face of the dispenser. Be sure to hold the knobs in the off (horizontal) position while doing this. Once the knobs are off, peel off both 2 product stickers from the face of the dispenser. Apply the new 3 product stickers to the face of the dispenser. Reattach the 3 removed knobs to the dispenser. Attach the long grey discharge tube to the white eductor. This allow users to dispense All Surface Floor Cleaner to a mop bucket. Be sure to place all discarded discharge/product lines deep within trash containers to ensure employees are not exposed to any caustic products that may within them. Gather up the old dispenser and racks and place them in an empty card board box (empty one of your installation kit boxes for thus purpose). All old equipment is to be saved; do NOT dispose of it. 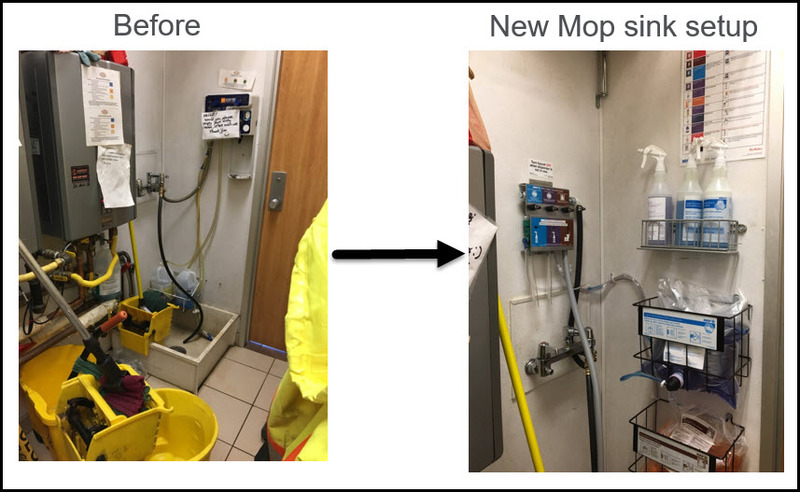 Start by mounting the dispenser back plate within the mop sink enclosure. Connect the water connection hose from the Y-valve attached to the faucet to the white elbow on the side of the dispenser. Be sure to tighten the collar so it does not leak! 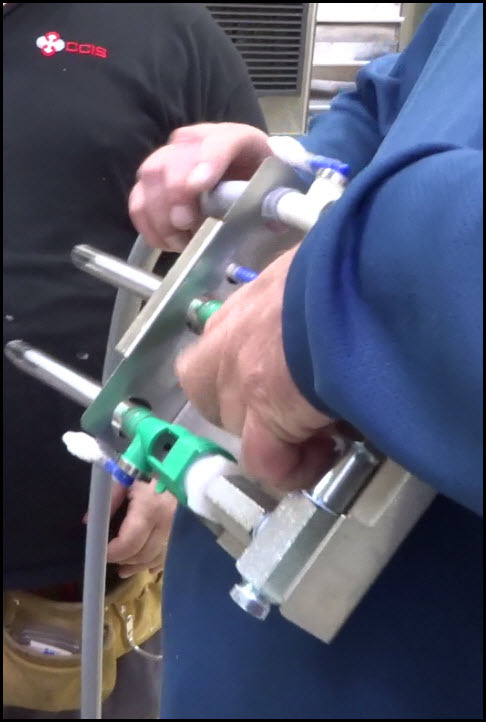 Attach a second water connection hose to the second branch of the Y-valve. 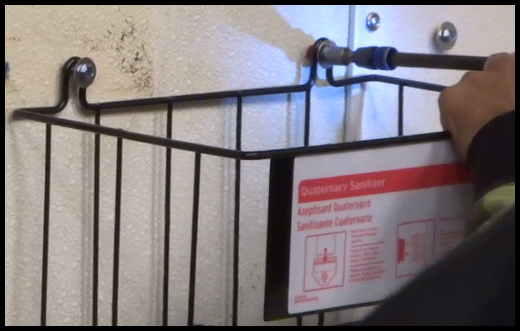 This will allow the users to dispense fresh water into the mop bucket when required. Apply product stickers to product racks before mounting them to the wall. Be sure to plan out your product rack placement before starting to mount them. A common layout is the "pyramid" configuration, which is often ideal where space permits. 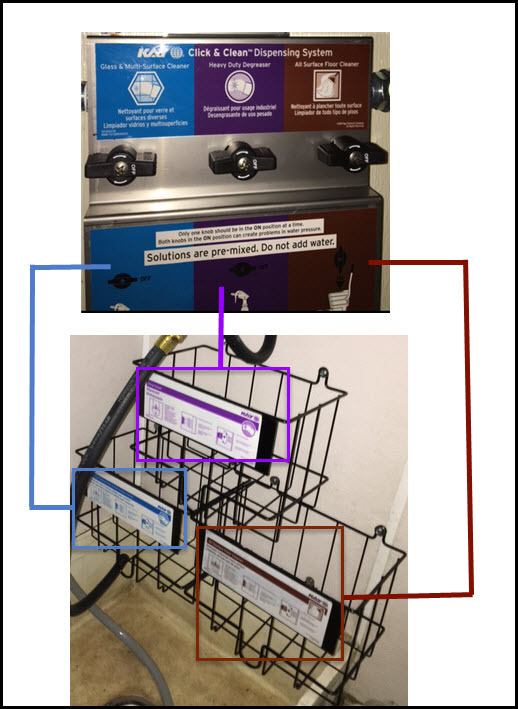 When considering the placement of product racks, keep in mind that the leftmost rack needs to correspond to the leftmost product dispensed by the equipment. 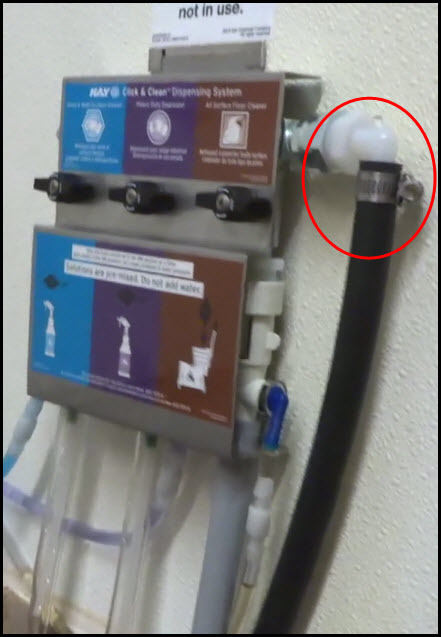 Place the water valve shut off sticker next to the dispenser where it can be clearly viewed by the user. Place the Cleaning Guide Wallchart in a high visibility area at eye level. 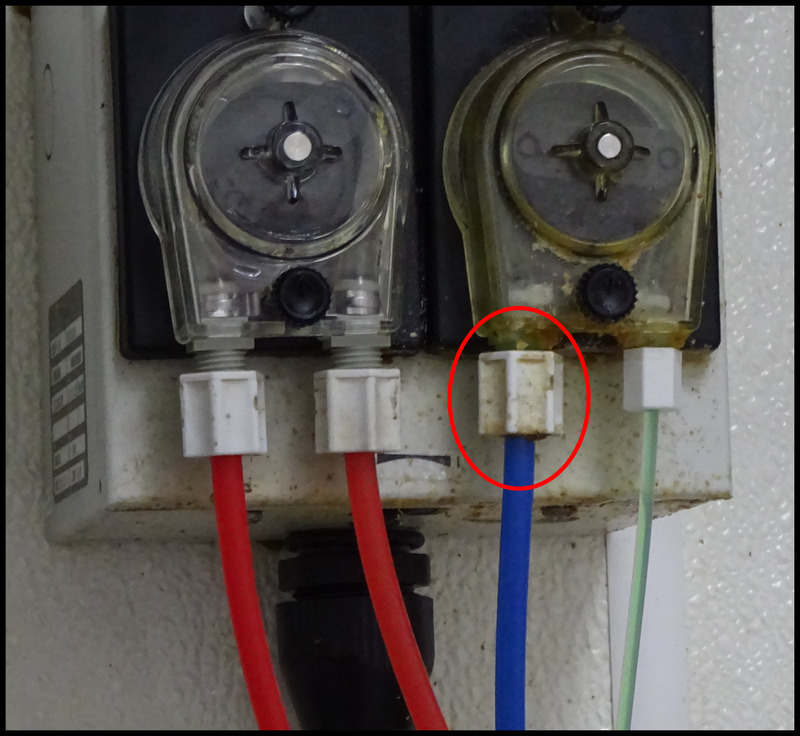 Use silicone when mounting; the attached sticky tape is not adequate. Install the Spray Bottle Racks. There are two Spray Bottle Racks in each kit. One should be placed near the mop sink and the other near the compartment sink. Be sure to check with the manager to confirm the placement location is ideal. Be sure to fill up each type of spray bottle and place it on the rack. Ready availability of the product will help ensure users are actively using their new cleaning program. A small percentage of restaurants will have a second mop closet. These secondary mop closets will have a 1 valve click which will dispense All Surface Floor Cleaner. Be sure to use the correct metering tip for Floor Cleaner (Turquoise). Where do the "shut off water valves" stickers get placed? Next to the dispenser, in clear view. What do you need silicone for during the install? 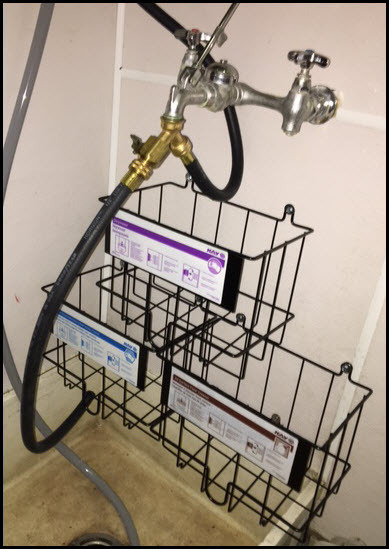 Mount 2 Products Racks for Detergent and Rinse Aid (See Pic Below) using 2 screws in the top and 1 screw in the bottom center. Washers must be used with the 5/16” screws. 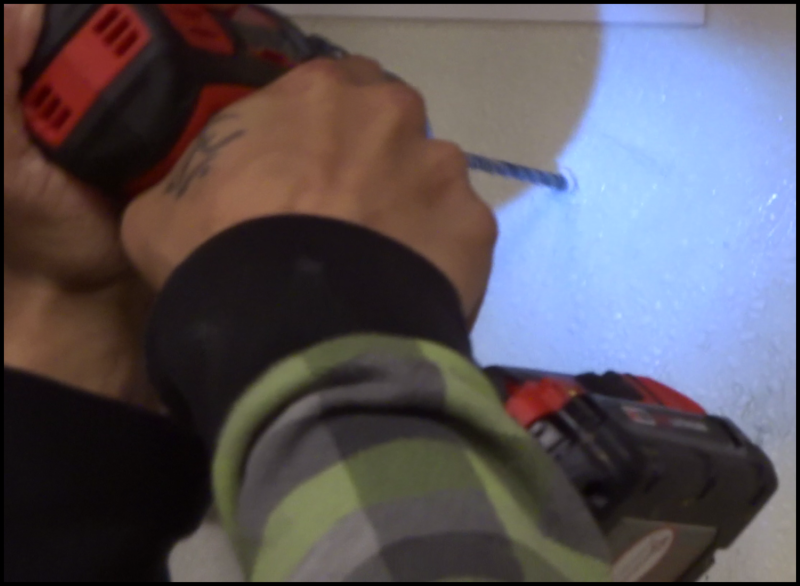 Always drill slowly into the wall surface in case you encounter non-drillable items such as pipes, electrical etc. Be sure to wear safety glasses and gloves as the detergent is caustic. If you get this chemical on your skin – wash with cool water immediately. 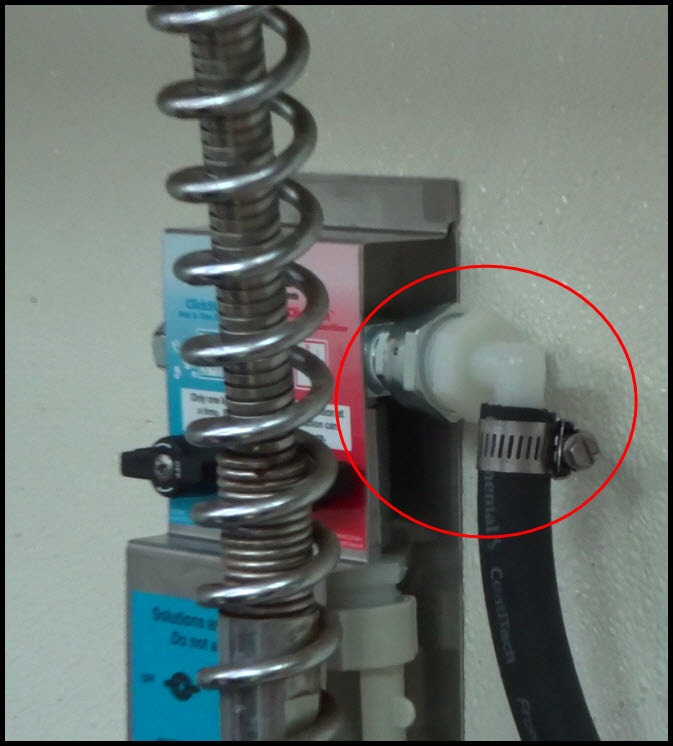 Do not remove squeeze tubes from the pumps – we will be reusing. 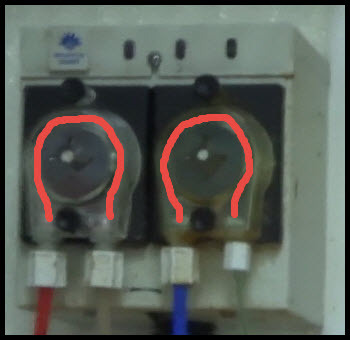 They are found within the pump itself... see red lines on picture to left. Detergent (Left side of Pump) - Remove the compression nut and ferrule from the squeeze tube threaded body on squeeze pump. Be sure to keep these fittings as we will reuse with new tubing. 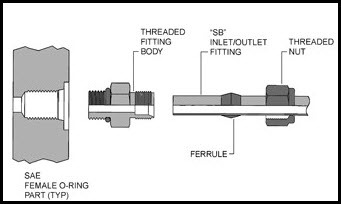 Above: Diagram of compression nut/ferrule. Remove the red detergent line from the existing product container and place in a separate garbage bag – tie it shut to insure safety. The other end of the detergent line is secured to a 90 degree elbow fitting usually on the back right of the machine. Unthread the compression fitting and remove. 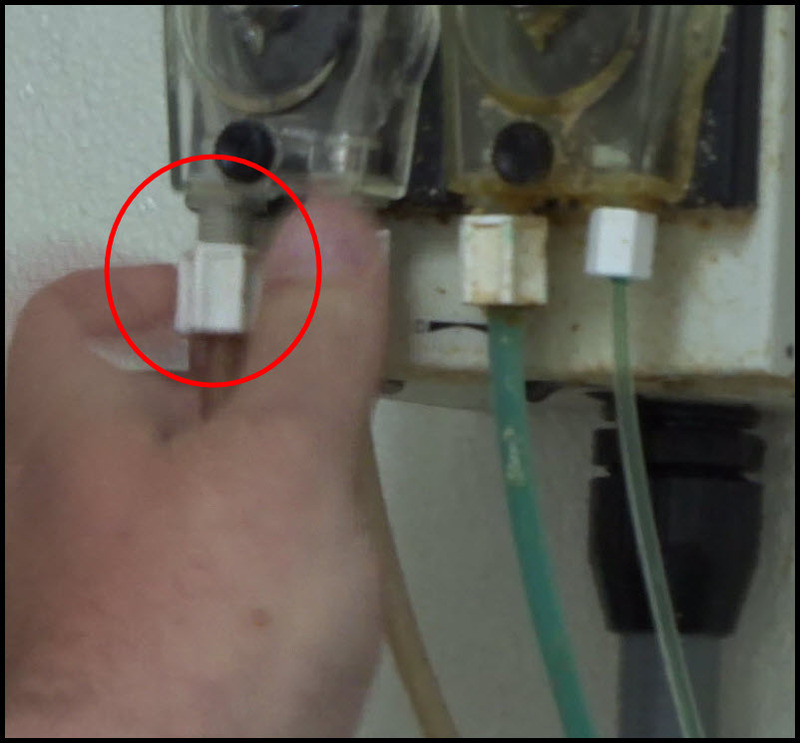 Disconnecting the existing Rinse Aid tubing is a similar procedure except for where it hooks into the washing equipment itself... see the last step below for details. Rinse Aid (Right side of Pump) - Remove the compression nut and ferrule from the squeeze tube threaded body on squeeze pump. Be sure to keep these fittings as we will reuse with new tubing. 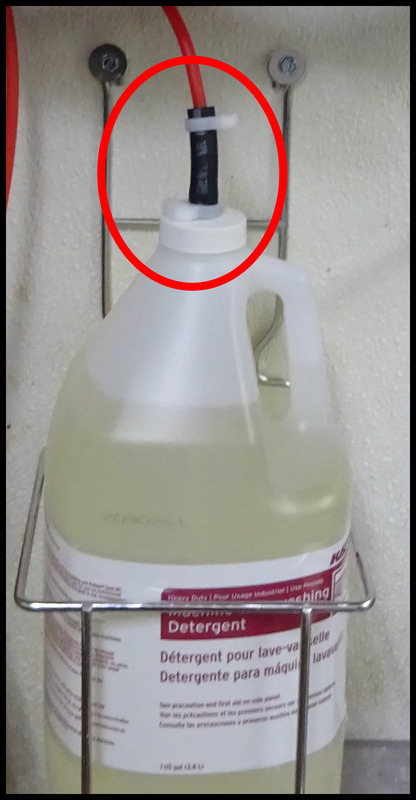 Remove the blue Rinse Aid line from the existing product container and place in a separate garbage bag – tie it shut to insure safety. The discharge side of the pump for Rinse Aid there is 1/8” tubing from the discharge side of the pump that runs to the rear top center of the machine. 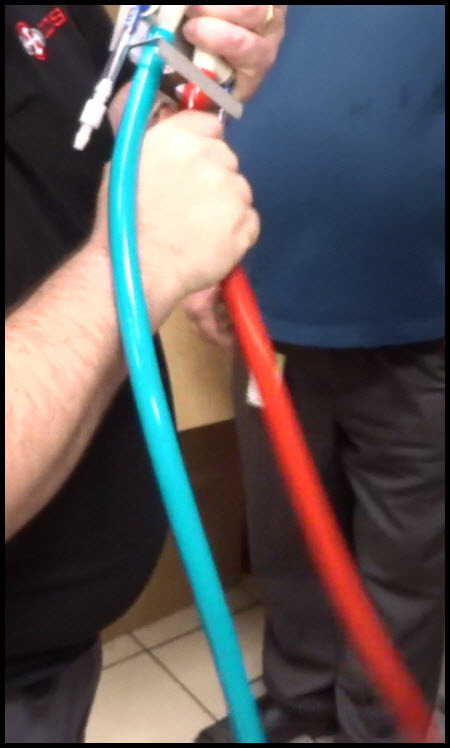 We need to reuse this tubing. 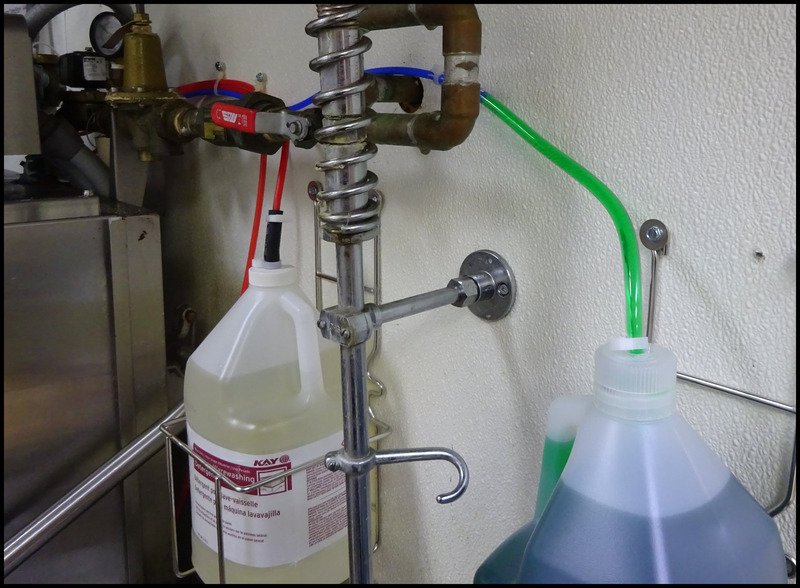 Find the Closed Loop Container Cap (With 2” Black Rubber Hose Attached) and Red tubing in Kit. 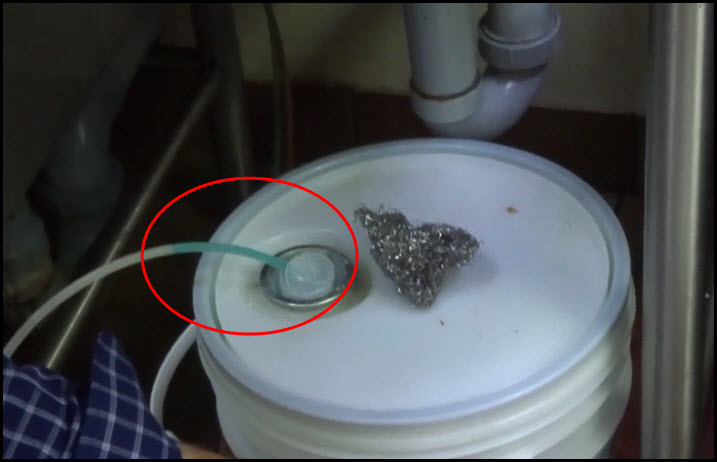 Install Closed Loop on Product Detergent Container. 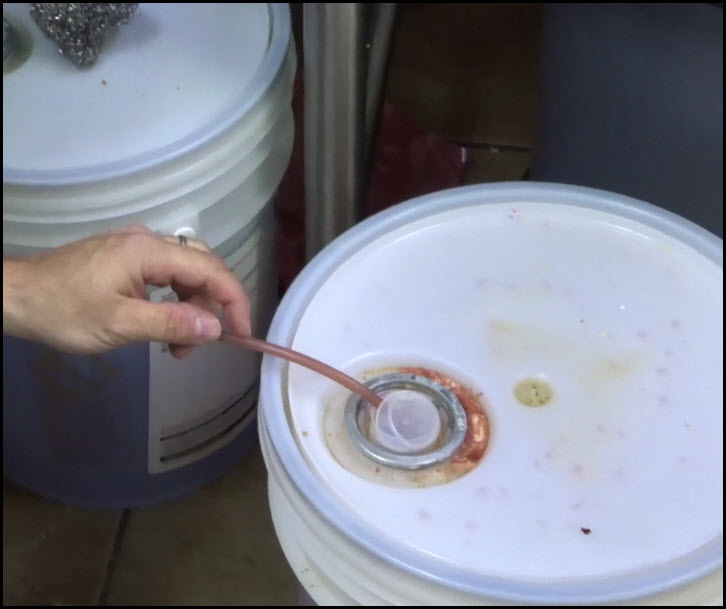 Insert red product tubing into rubber hose on cap – it will bottom out after 2 ½” and Secure with 2 white plastic hose clamps. Run the red tubing to the Detergent input (Left side of the Pump) Slide Compression fitting on tubing first then plastic ferrule. 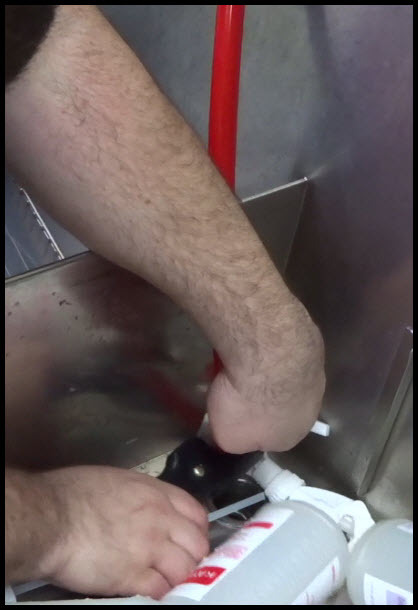 Push red tubing inside squeeze tube on pump and secure with ferrule and compression fitting – Do not over tighten, hand tight is enough. Run the red tubing to the Detergent output (Left side of the Pump) Slide Compression fitting on tubing first then plastic ferrule. 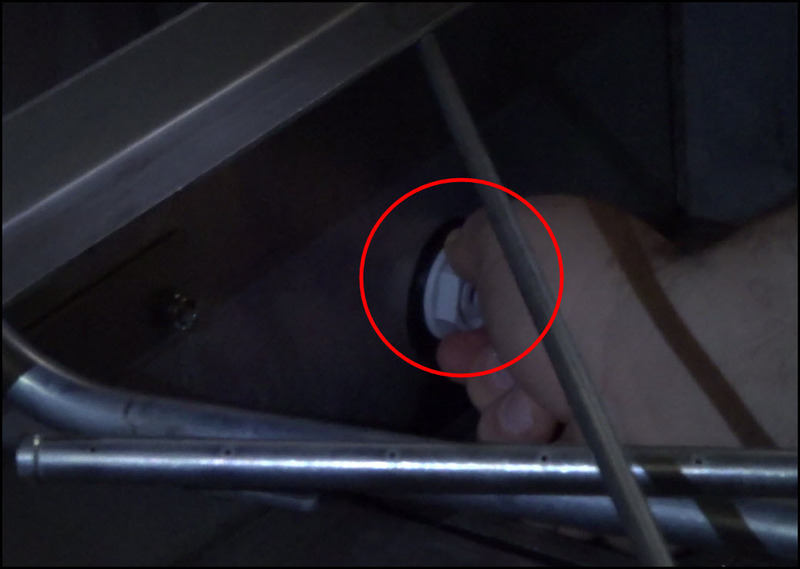 Push red tubing inside squeeze tube on pump and secure with ferrule and compression fitting – Do not over tighten, hand tight is enough. Then run the red tubing to the right rear of the machine and install a new 90 degree elbow from the install kit. Be sure to have a rubber seal on either side of the washer’s stainless steel construction. When tightening the nut inside the washer for the 90 degree elbow fitting – go hand tight and then ¼ turn with channel lock pliers. Source 1 open loop product tubing kit with foot valve, tubing and and cap. 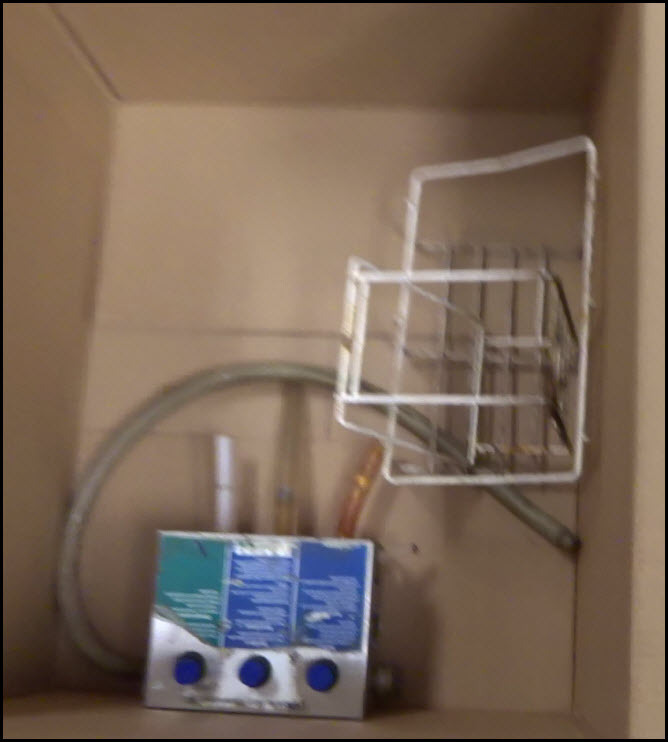 Place foot valve and tubing into Rinse Aid container and tighten cap. Depending on the distance of the pump away from the container cut the product tubing approximately 1-2 feet away from the top of the container and discharge excess. Insert the Blue Product tubing about 6 inches into the supply tubing connected to the container. Secure tubing with 2 zip ties. 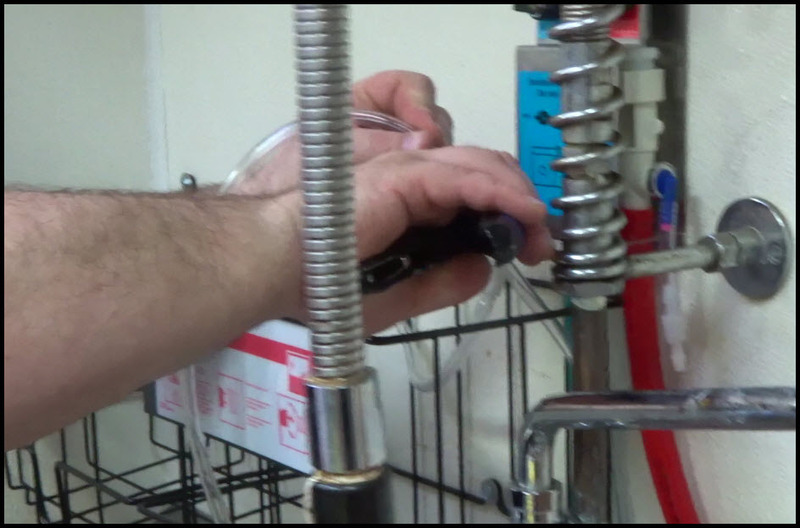 Run the Blue Rinse Aid tubing to pump and install Compression nut and ferrule on new tubing then insert tubing inside the squeeze on pump – Secure with compression fitting and ferrule. 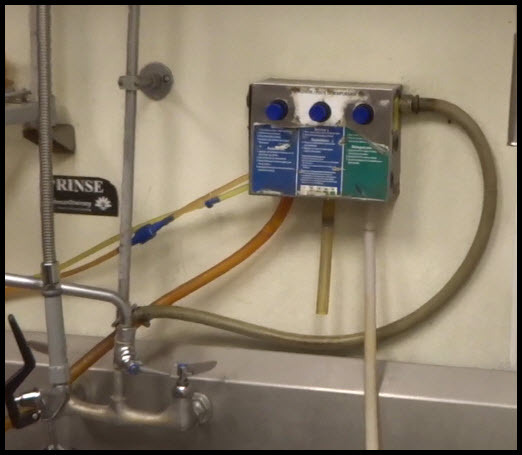 On the discharge side of the rinse at tubing – the tubing runs to the top rear center of the machine. There is a plastic fitting that threads into the machine, please remove and clean off with a dry rag. 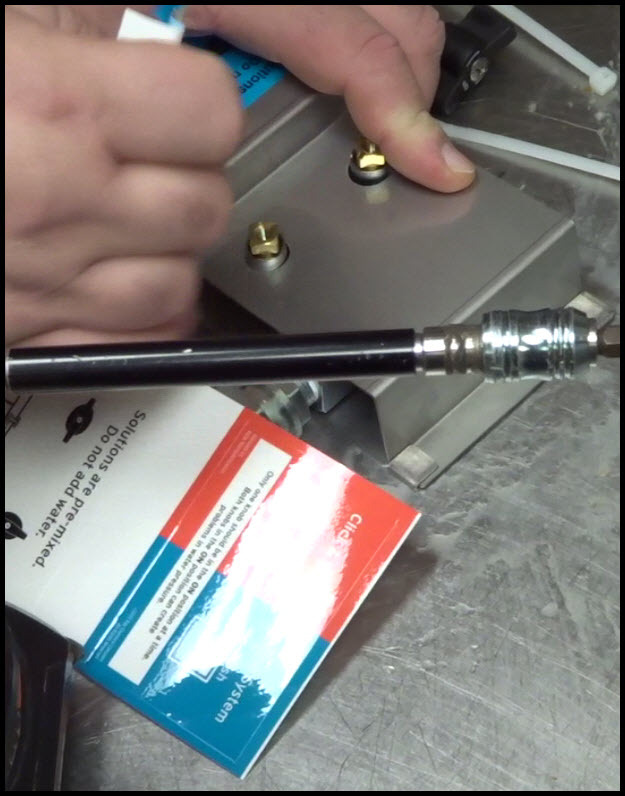 Place a small amount of silicone on the threaded fitting and secure to the machine. Do not over tightened. Once all is connected run the machine by opening and closing the door of the machine. It will automatically start its 3 min plus cycle. The detergent should prime without any issue however it may take a few cycles. 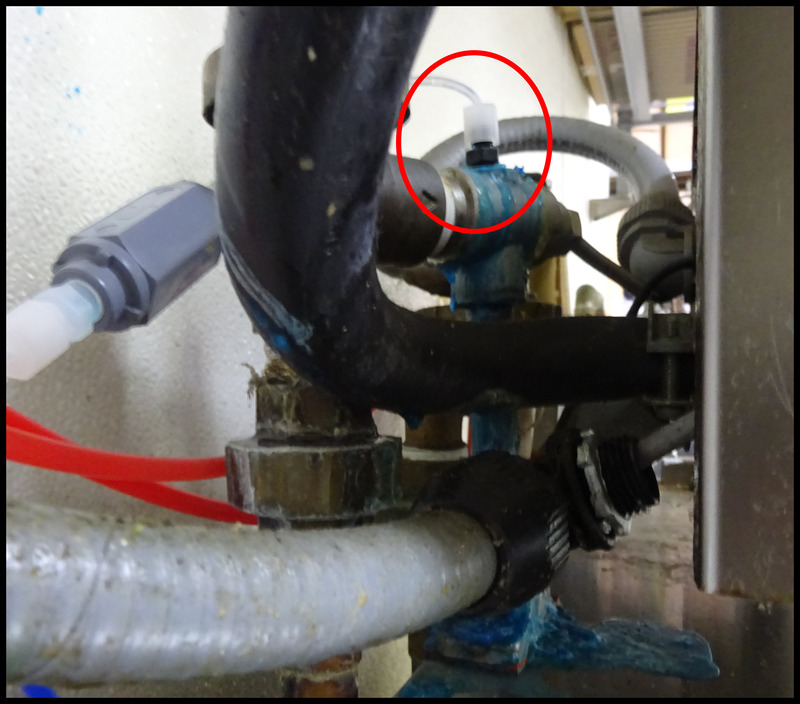 The Rinse Aid may take more cycles however we recommend moving on with the rest of the install and the system will self prime as the staff use the machine. A line that has not yet been primed is pictured above. A primed line is pictured above. Notice the green product in the tubing. If you have a high temp warewash machine onsite should you leave it to the end of the install? Which product is the red tubing connected to? Evaluate placement to determine if the same location can be utilized. In most cases, the same location and mounting holes can be used. 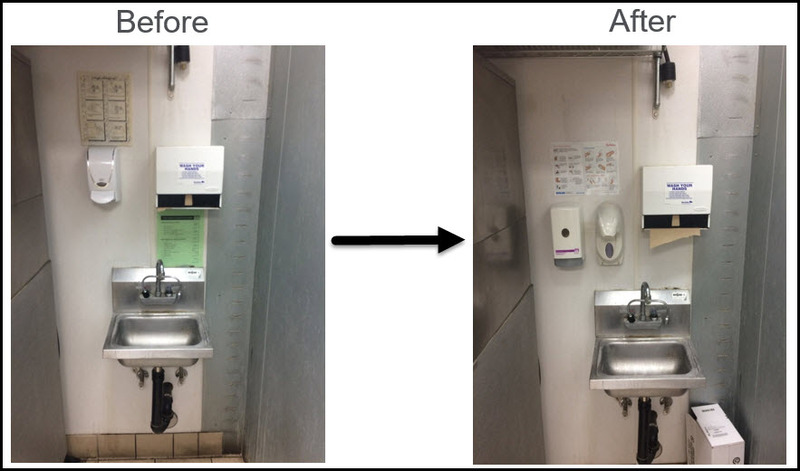 Sanitizer is always on the left, soap is always on the right UNLESS space dictates otherwise in which case soap is always closest to the sink with sanitizer next to soap. 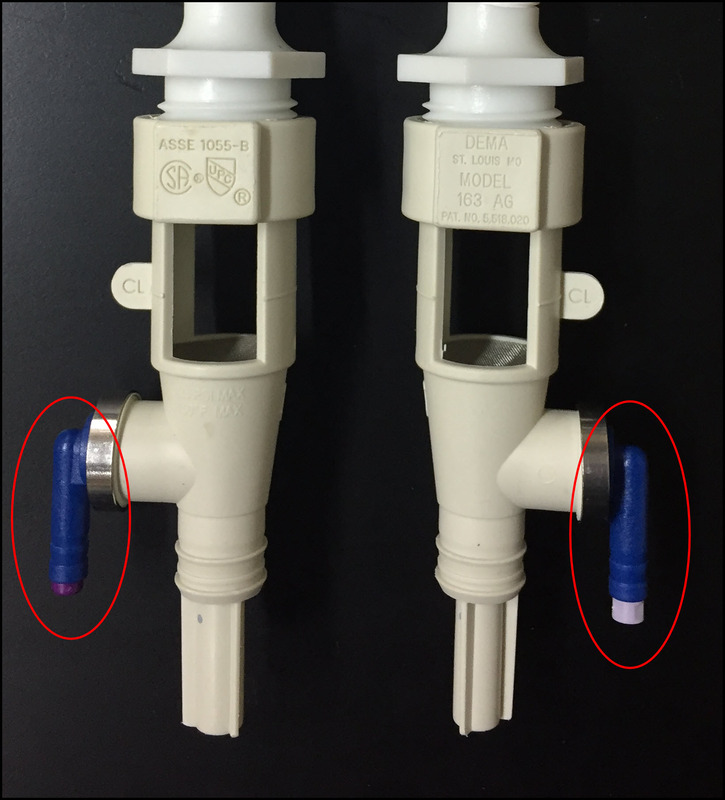 NOTE: The number of dispensers included in the installation kit varies on the needs of the location. 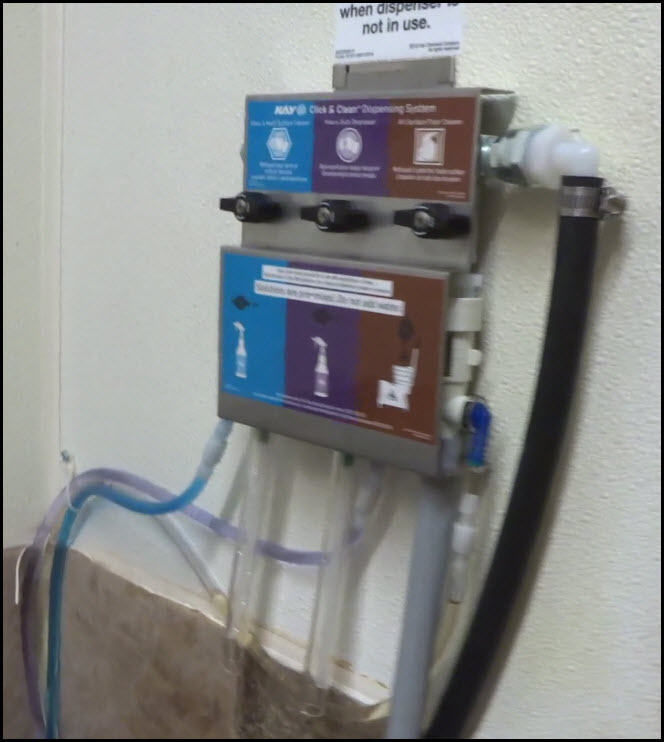 These should be installed in back of house and/or where existing dispensers are located. Back of house is the priority. 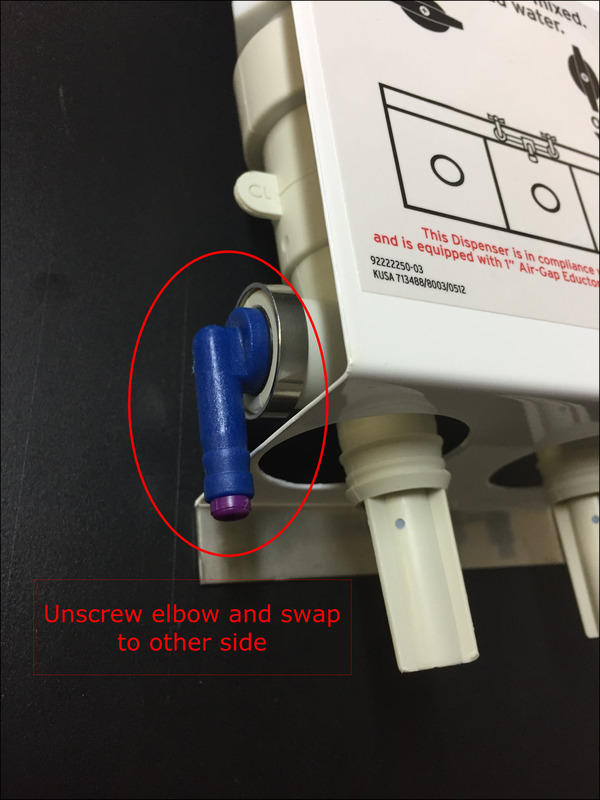 Be sure to note on your sign off if additional dispensers are required by the site. 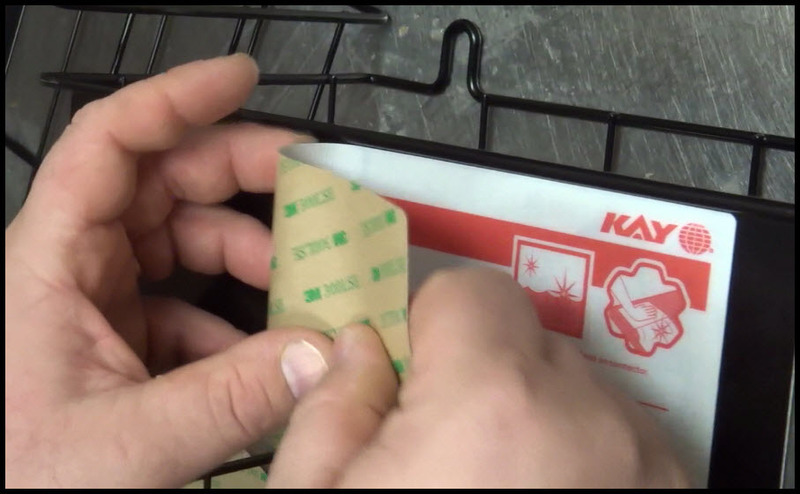 Remove the protective backing on the tape that is on the back of the dispenser. 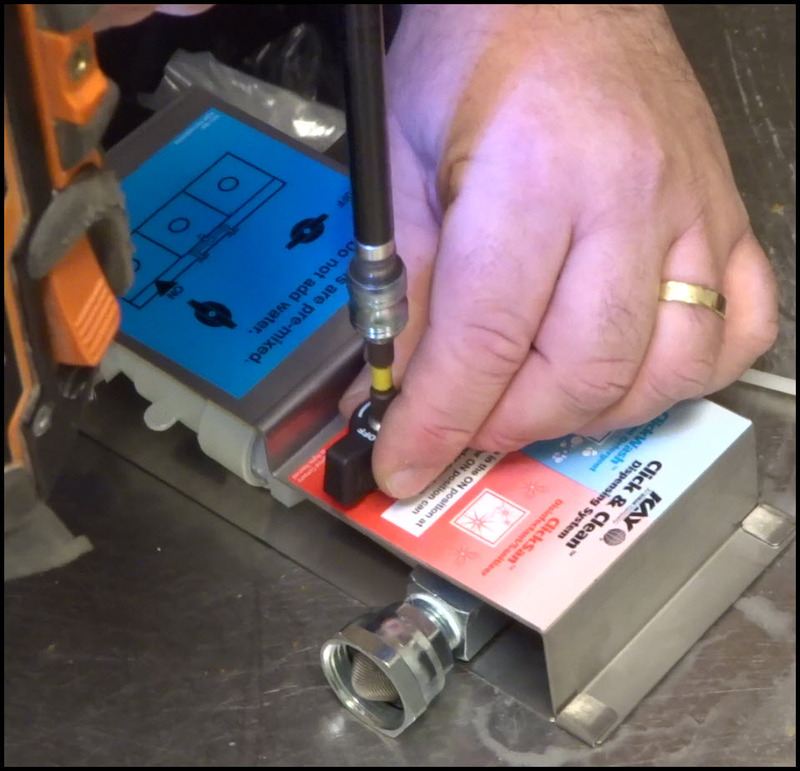 Mount the unit by pressing the unit against the mounting surface aligning the markings of the screw hole locations. Apply pressure to the back of the plate for 30 seconds to assure a good bond between the tape and the wall. 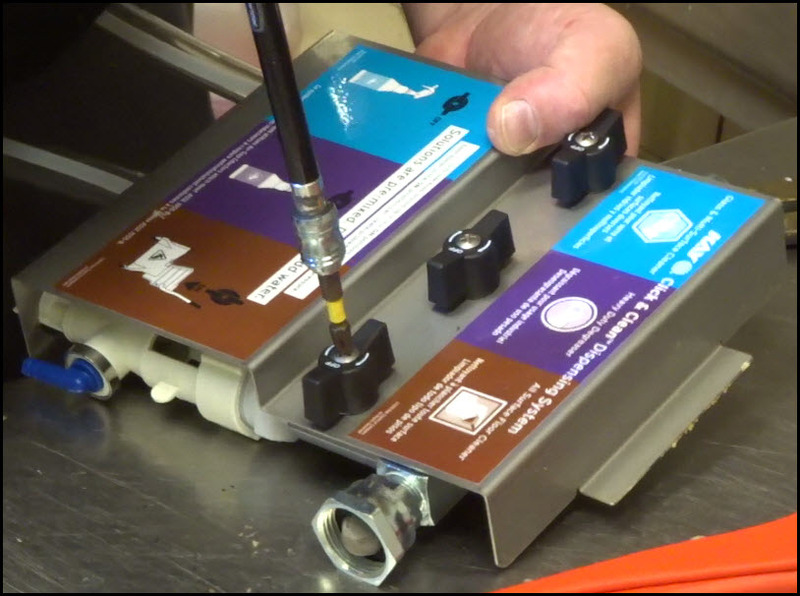 With the dispenser front cover open, insert the screws through the tape into the anchors via the markings made in step one. (Use at least 2 screws to secure each dispenser). Clean and thoroughly dry the wall. Place the unit against the wall at the desired location. Using the holes on the back of the dispenser as a template, mark the wall with a pencil or sharp object. Use an appropriate size drill bit for the anchors. Drill the holes. Insert anchors into the holes. 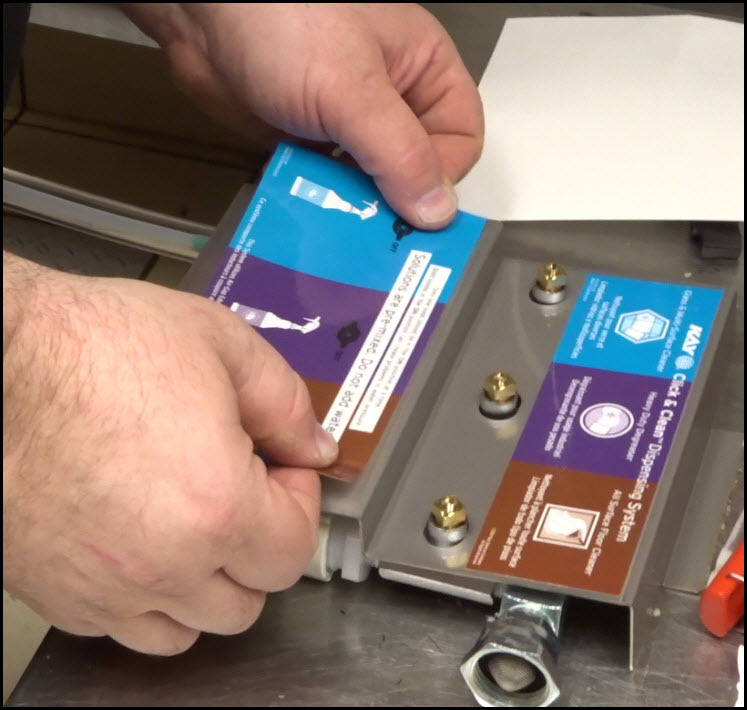 Remove the protective backing on the tape that is on the back of the dispenser. Mount the unit at the desired location by pressing the unit against the mounting surface. 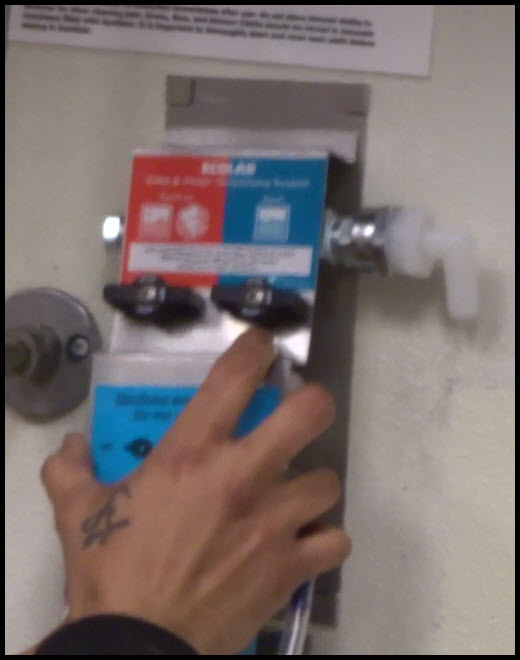 Open the front cover by pressing the release button on the side of the dispenser and gently pulling down. Apply pressure to the back of the plate for 30 seconds to assure a good bond between the tape and the wall. Insert the screws into the anchors. 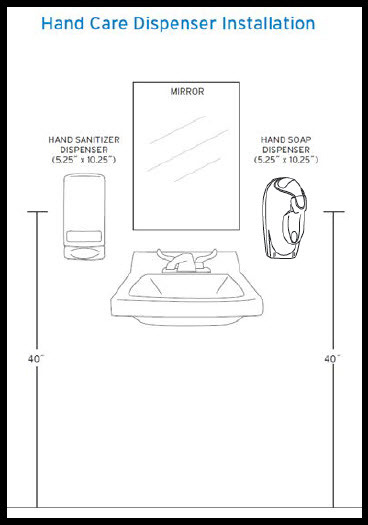 Install Hand Wash Charts at the staff areas where you put up handcare dispensers. Hand Wash Charts should NOT be installed in customer accessible areas. Pictured right: Example of a designated Handwashing sink. 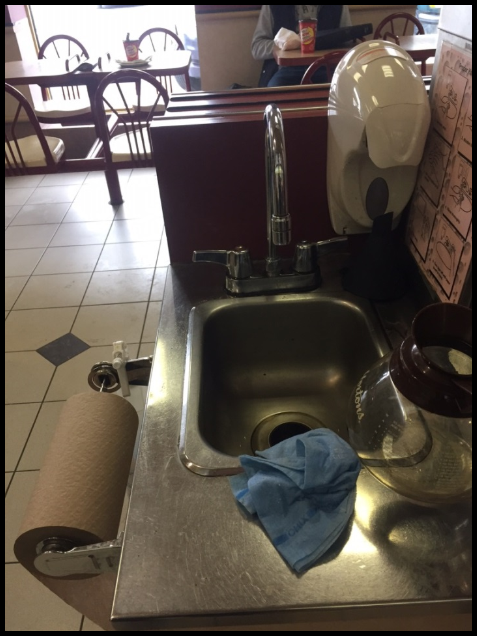 Speak with owner and find out which sink is the least used for dumping coffee to create “Hand Washing” sink. 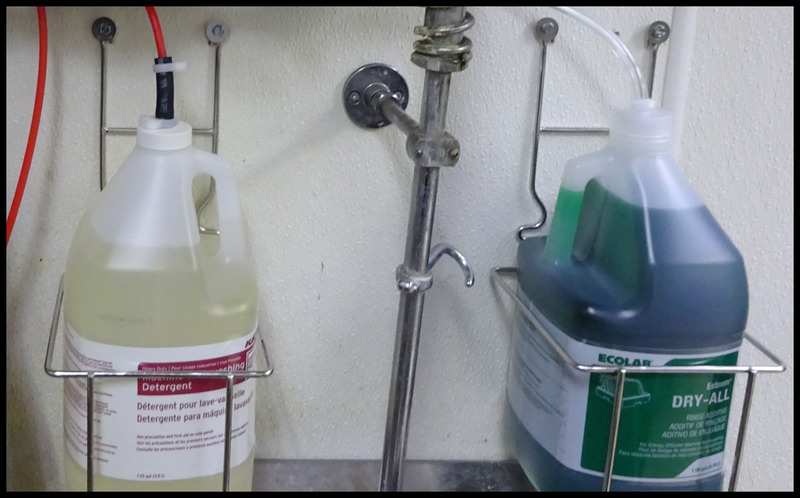 Remove in line counter jugs (under counter) FROM ALL OTHER handwash stations in front of house. 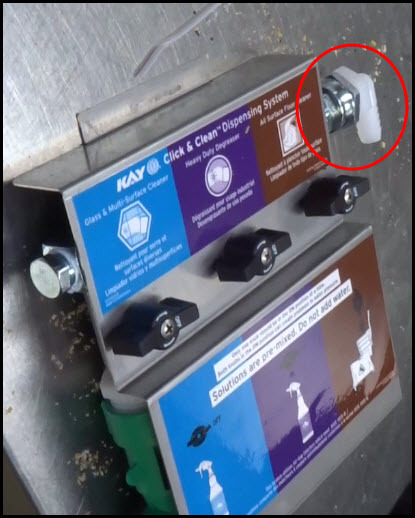 For all coffee dump sinks that are no longer the designated hand washing sink..
What is the minimum amount of screws to be used in each dispenser? Be sure to test any plumbing before you start to perform any work. If a leak is discovered, report it to a manager and document it. 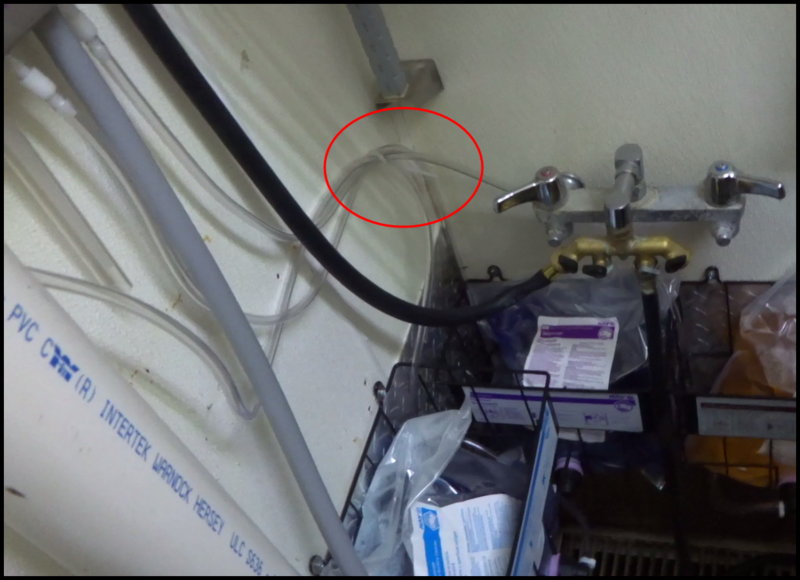 If you perform work without checking for leaks, it can lead to problems if any occur after you have completed the installation. Do your do diligence and take the time beforehand. On behalf of all the team at CCIS, we cannot thank you enough for taking the time to complete this course, and for all the things you do to continue to support our customers each and every day. The project of rolling out Tim Hortons locations is the largest scale project that can occur in Canada- so the expectations are very high. We have had to add over 20 new Technicians to our team to complete this project, which is exciting and hectic at the same time! We will be in contact with you weekly (if not daily) as this project rolls out and we ask that you call us if you every need any help, any time of day! Thank you again, and good luck with the sites in your market!